Are You Trying to Fix a C30A with the top half stuck to the bottom? Are you interested in the History of the Landers, Frary and Clark Company? 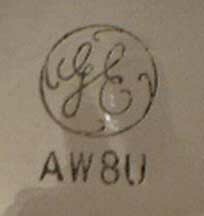 The General Electric Model 129P8? 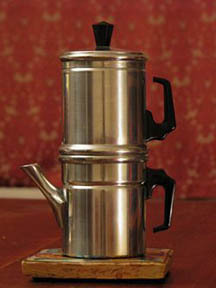 The Napoletana Fliptop Coffee Brewer? 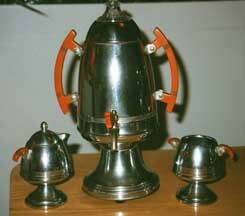 The Chase Art Metal Coronet Coffee Service? 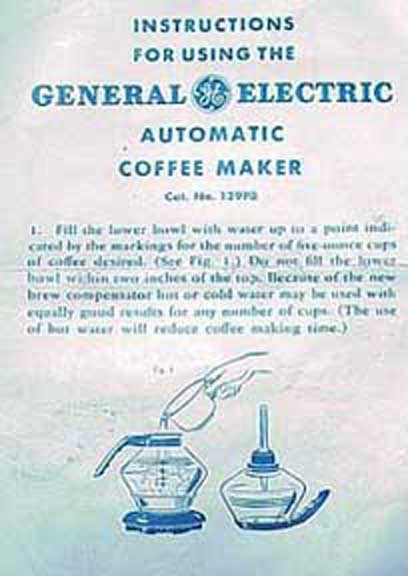 The Manning-Bowman Harmony Coffee Service? The Chemex Coffee System (or James Bond)? 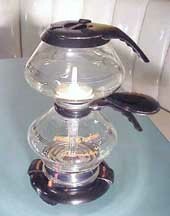 The the West bend Kwik-Drip Coffee maker? Are you having trouble getting the top and bottom of the C30 separated? 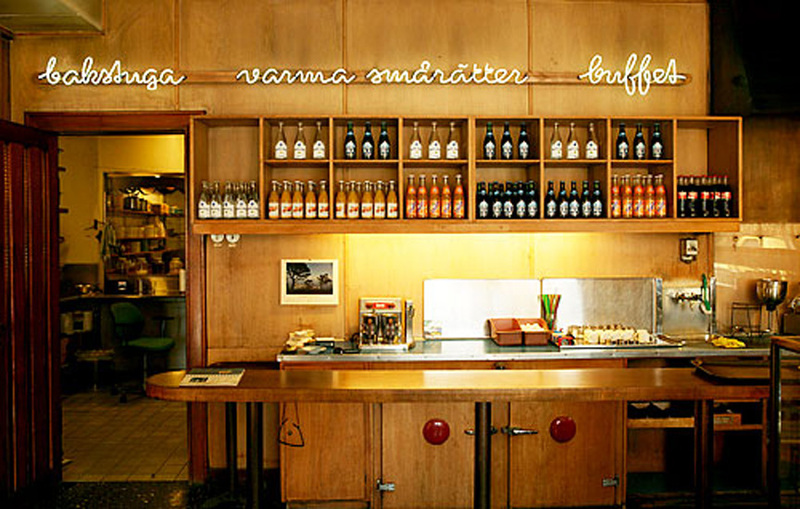 The Konditori Valand (Stockholm, Sweden)? 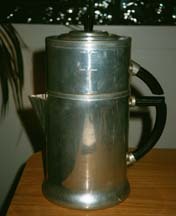 United Metal Goods Coffee Makers? 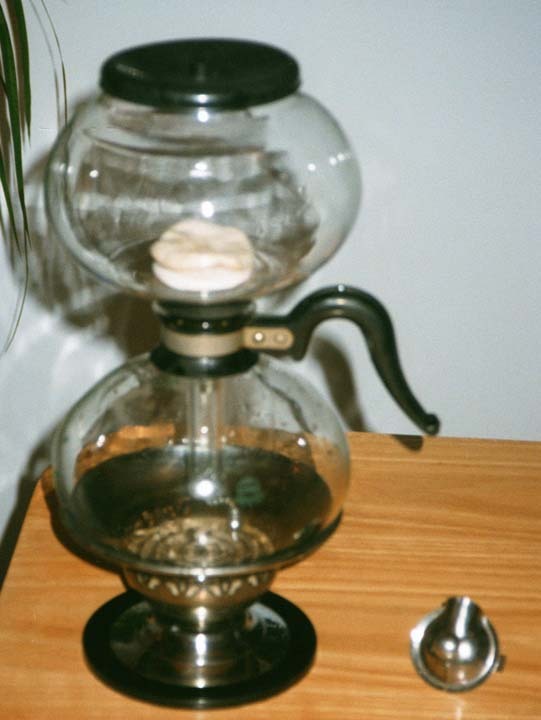 Click here to visit another fine collection of coffee paraphernalia. In addition to coffee makers, we have a Calendar of Swing Dancing in DC, a Directory of Vintage Clothing Stores and a Guide to 1940s Collectibles. Thanks for tuning in! Feel free to Contact Me if you have questions or want to share photographs and chat over coffee with the rest of the readers. 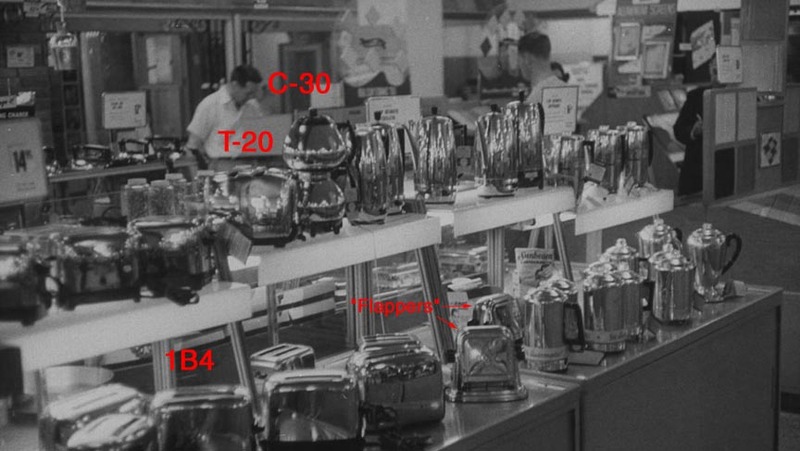 Here is a wonderful photograph from the mid 1940s showing a display of appliances at a Sears store in Chicago. 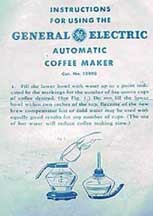 Many of the Coffee makers are described below and the toasters can be found on our Mechanics of Toast Page. Keith's painting depicts the Hussaria smiting down the Janissaries, the cream of the Sulan's armies. In turn, they have an interesting history: they were special troops made up entirely of Christian children abducted as infants and raised to serve the Sultan. Those of you who are familiar with Mozart's Abduction From the Seraglio may recognize the Janissary Chorus. On a minor note, a reader sent this in: "... the Mongols used a kind of "lasso" against armored cavalry; a defence against the lasso was a frame that would require a lot more height to capture the rider. In many cases, the "wings" were attached to the saddle and they served the same function as a motorcycle "sissy bar," especially when the cavalryman rammed his 20 foot lance into an infantry square at full gallop...." I was somewhat saddened to find functionality in this expression of sheer bravado..
Our reader Duane tempered our enthusiasm for the Hussaria and gave us a new insight into another Breakfast Pastry: "... It was a combined army of Bavarian, Saxon and Poles under John Sobieski II who relieved Vienna. 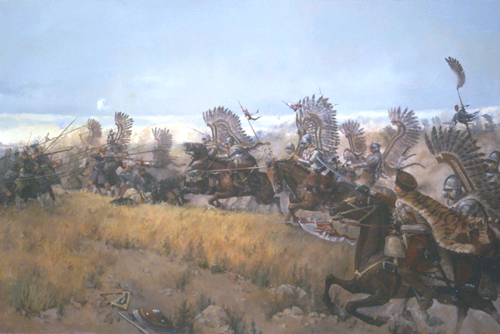 Sure the famed Hussaria did make impact but actually it was a combined charge by Hussaria, Pancerni ( more lightly armed Polish cavalry) and collective German horse, mostly pistol armed, that broke the Jannisaries. The rest is correct. Another legend holds that the bagel was invented at that time to represent a stirup and thus comemorate the Hussaria charge..."
So there you have it -- The History of Coffee, Motorcycle Reality Shows, Heavy Cavalry, Pastry, and Mozart. Coffee has a very complex Chemistry: There are many, many separate organic compounds in brewed coffee. For the chemistry of aroma, alone the number is well over 800 and as analytical methods become more precise more will be uncovered. Various research groups have identified 150 aliphatic compounds including 56 carbonyl compounds and 9 sulfur containing compounds; 20 alicyclic compounds, including 10 ketones; 60 aromatic benzenoid compounds, including 16 phenols; 300 heterocyclic compounds, including 74 furans, 10 hydrofurans, 37 pyrroles, 9 pyridines, 2 quinolines, 70 pyrazines, 10 quinoxalines, 3 indoles, 23 thiophens, 3 thiophenones, 28 thiazoles, and 28 oxazoles (34). 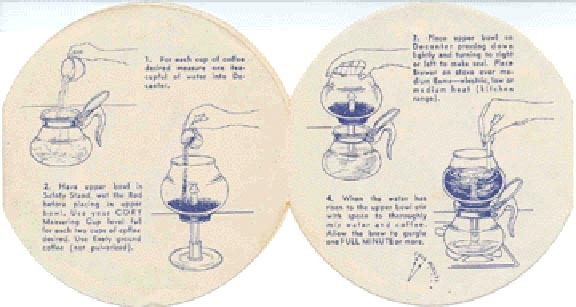 Without going into a complex chemistry lecture, (Click Here if you want one...) the secret to a great cup of coffee is hot but not boiling pure water. Distilled water is best. If the water temperature exceeds 201 deg F (94 C), highly objectionable organic acids will form, creating a bitter taste. Any contact between coffee and metal will also form organic acids which detract from the taste. The actual type of coffee being brewed is quite secondary to water purity and temperature. If your apparatus is clean and you use pure water at 94 C, you can get a MUCH better cup with generic supermarket coffee than you can get from very expensive boutique coffee in a dirty machine. BOKAR is still my all-time favorite! 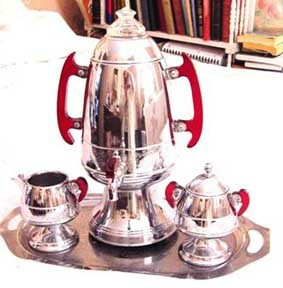 Boiled Coffee is made by placing ground beans in a container and boiling the mixture. A variety of schemes are used to clear the grounds from the brew. This is most associated with cowboys on the trail or soldiers in the field. With lots of care, it is possible to make a decent cup of coffee this way. 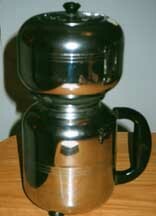 Drip Coffee Makers require an external source of hot water. 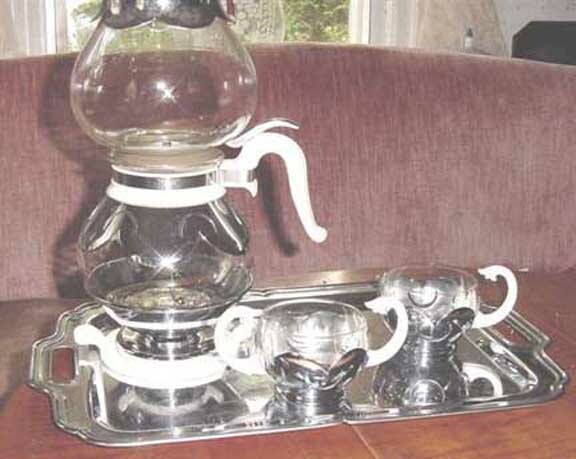 Ground coffee is placed in the top unit; water is poured into the grounds, creating the brew which drains through a filter into the serving pot. The filter can either be paper or a porous metal screen. 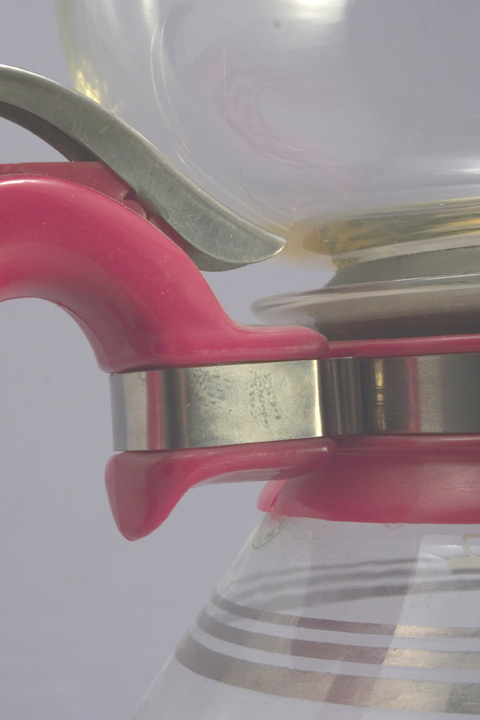 Drip makers generally make the highest quality brew because the coffee itself never boils. 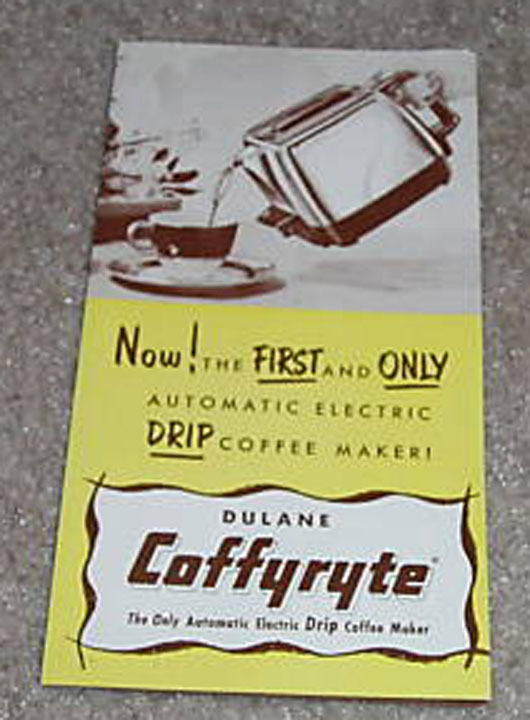 However, until the "Mr. Coffee" type machines came along, there was no way to brew drip coffee automatically. 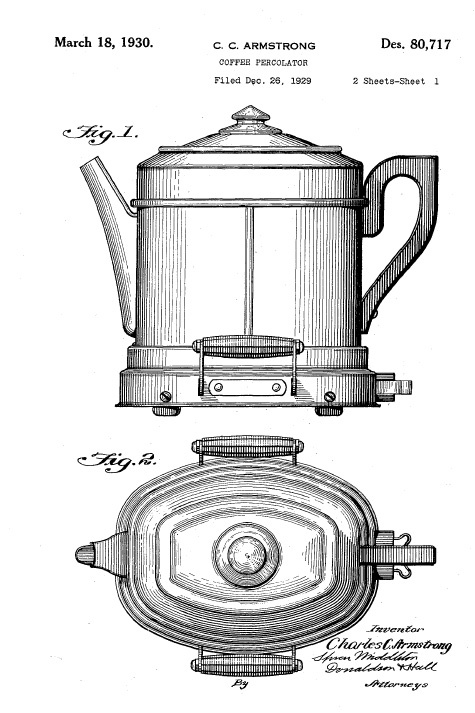 Percolators are an attempt to integrate the functions of water heating and brewing. The grounds are placed in a small chamber at the top and plain water goes into the bottom. The water is heated; as it boils, it travels up a small tube and sprays out over the grounds. 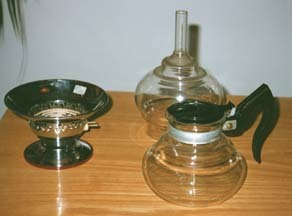 Brewed coffee drains downward into the bottom chamber. A glass top lets you see how dark the brew is (and turn the thing off). 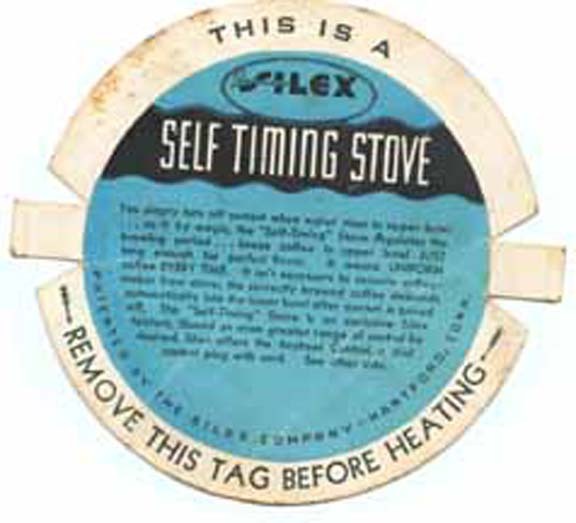 The source of heat can be a stove or a built-in resistance coil. 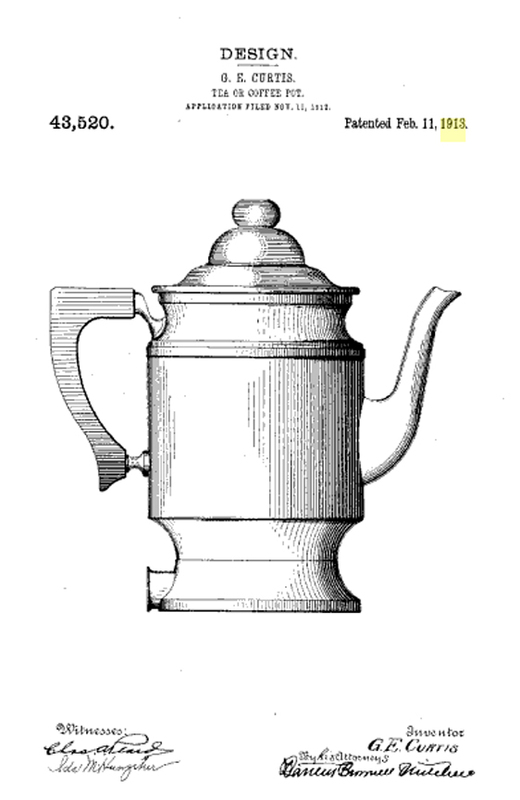 This is probably the least desirable method of brewing because the coffee can be boiled -- increasing the formation of organic acids which taste bitter. Vacuum Coffee Makers also integrate the heating and brewing functions. 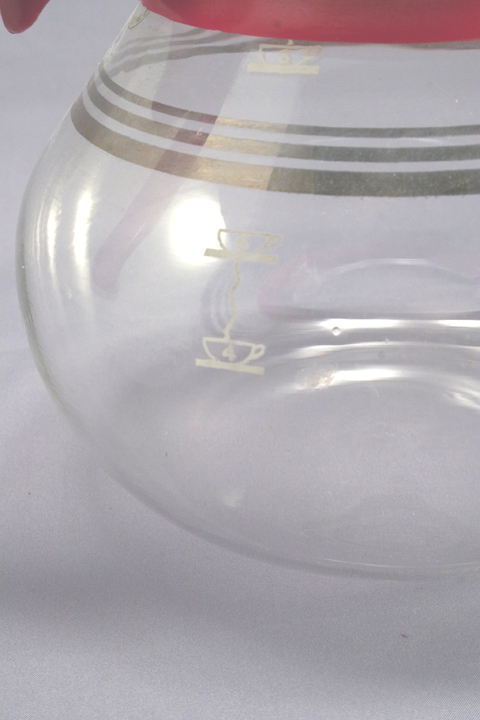 Coffee grounds are placed in the clear glass vessel on the top. Water is heated in the bottom component. 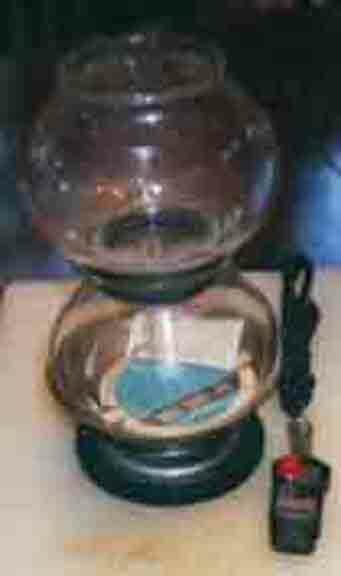 Air, heated in conjunction with the water expand s and forces hot water upward in the tube and contacts the grounds, brewing the coffee in the upper chamber. 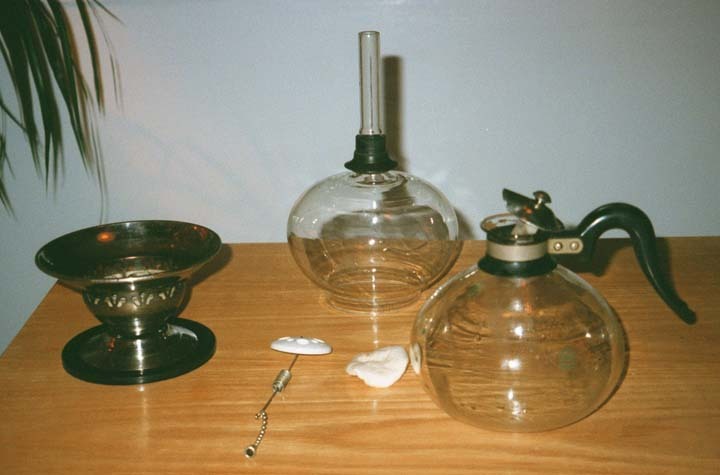 The water in the upper chamber never exceeds 201 degrees farenheit, so the ideal temperature is maintained. 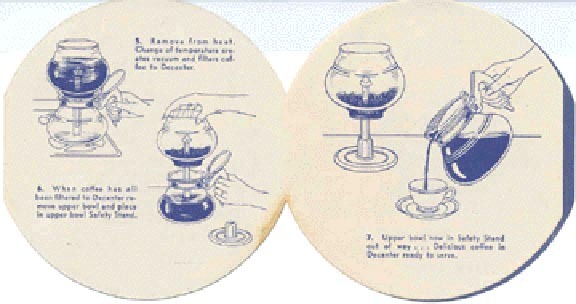 The brewed liquid remains in the top chamber until the unit is removed from the heat; the temperature change induces the vacuum between the lower and upper chambers, which draws the brewed coffee back downward into the lower pot. 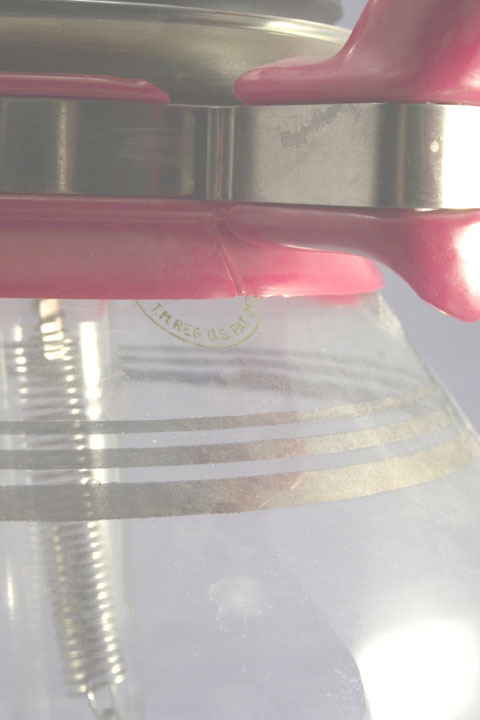 The vacuum seal is not broken until all of the coffee has been drawn back down naturally, and the last gush of air is heard to gurgle (which is caused because evaporation and absorption of water by the grounds produced slightly less water volume in the lower chamber than when brewing first started). After the gush of air and gurgling, the vacuum seal no longer exists. 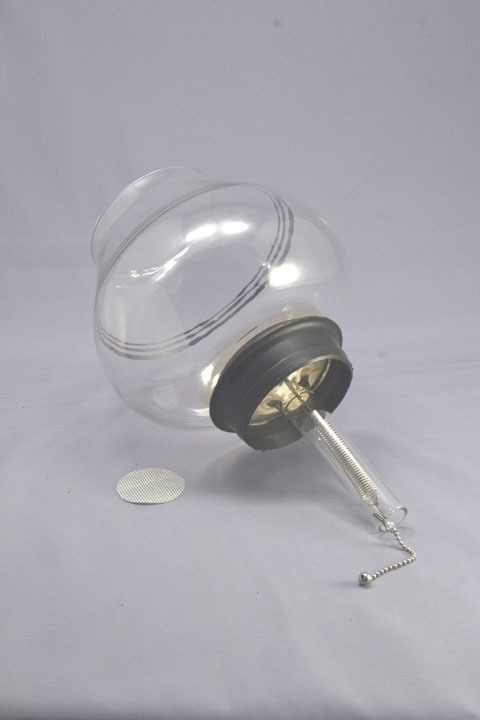 The heated water is allowed to mix with the grounds freely in the chamber; however once the vacuum has started, the grounds become tightly compressed into the bottom of the upper chamber, acting as their own filter. The force of the vacuum pulling the water down through the grounds at a high pressure helps to express the coffee, similar to the espresso brewing. It's much different than a drip method, which is done as water drains through the grounds by gravity. 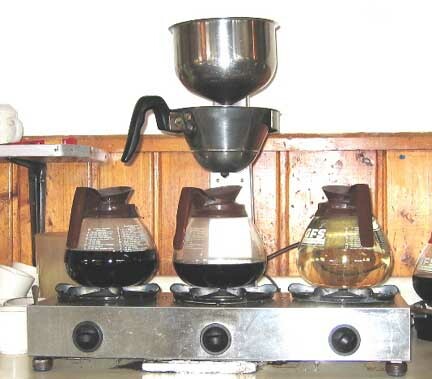 On the other hand, The drip method produces bitter oils; however, part of what makes vac pot coffee taste so good is the limited amount of time that the water is allowed to be in contact with the coffee grounds (like with espresso). 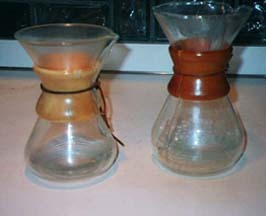 With drip coffee, the longer exposure time allows more bitter oils to seep out. 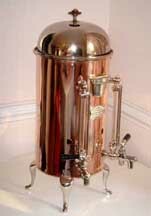 Yet, vacuum brewing is extremely complex and subject to numerous mechanical problems. The advantage is that the process assures that water never exceeds the optimum temperature. All glass versions assure that there is never any coffee-metal contact. These machines are blindingly complicated. 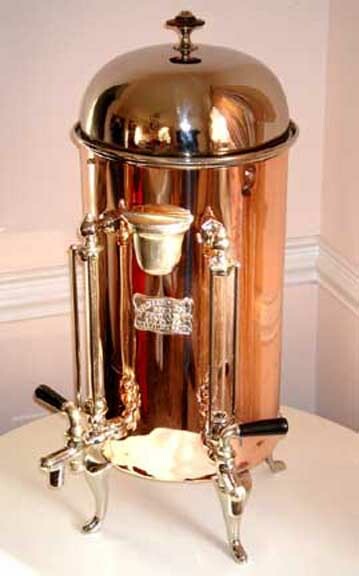 Vesuvio Systems In general, "espresso" the term refers to any method for brewing coffee with pressure and stepped down steam (rather than heated-up water.) 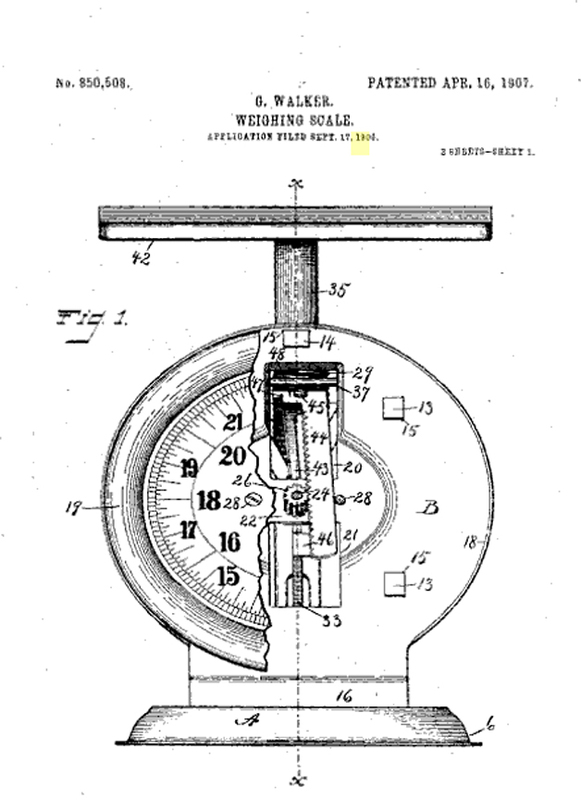 The most common home mechanism is the "Vesuvio" type which has two chambers. 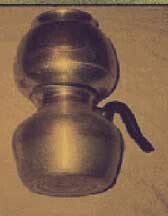 The bottom chamber holds water and the upper chamber is empty. A small cup filled with coffee grounds separates the two. 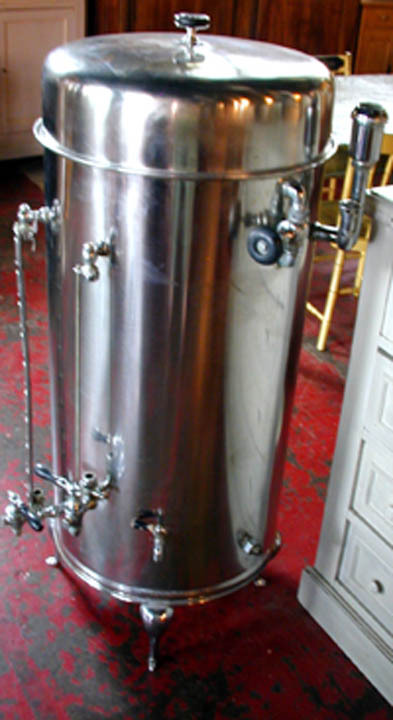 Water is heated in the sealed bottom chamber; when it becomes steam, a it passes through the coffee. In one sense the process is like percolation save for a clever design that keeps the brew from being constantly re-heated. True Espresso In a restaurant, the Espresso machine has a large steam reservoir (usually a big brass tank surmounted with an eagle...); the coffee is inserted in a small container and water condensed from steam is passed through it, under high mechanical pressure to brew the coffee. The machine has other steam taps for frothing milk for cappucino. 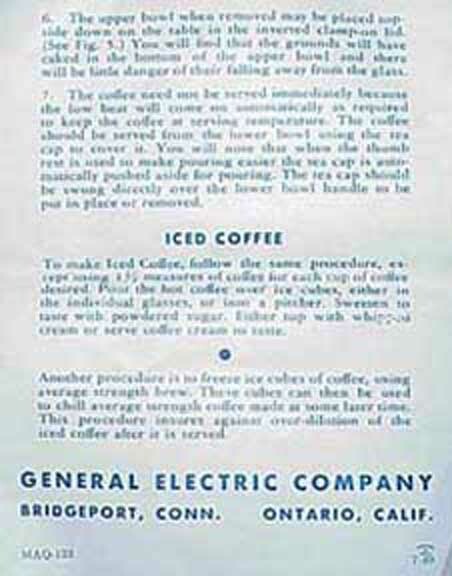 In Italian, the word "espresso" means "individualized" (as in "Made expressly for John Jones") -- however, mixed in with this is the connotation of steam trains with special schedules (as in the "Wabash Express") So, Espresso is coffee brewed with steam and pressure, made one serving at a time. Toot! Toot! This is a very nice matched coffee service that uses the Vacuum Process. 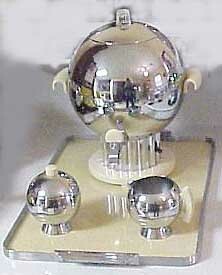 This set dates from the mid 1930s and features lots of very moderne details. The set was designed by Frank Woolcott and patented in 1934. This variant uses a cheesecloth filter that is kept in place by a spring. 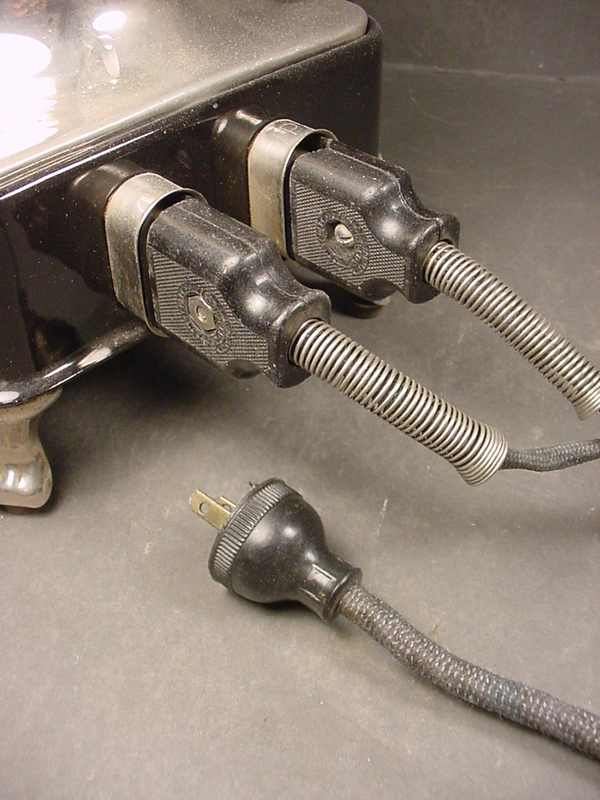 Like all appliances of the time, the cord was detachable. 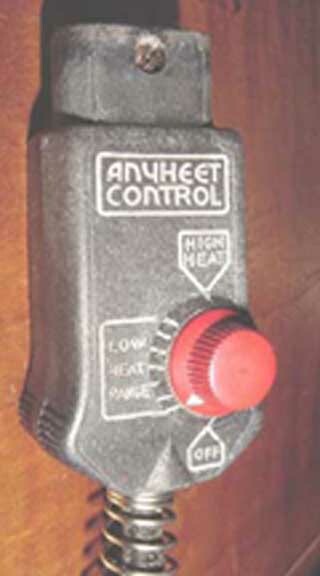 This version uses a cord with a resistance device (the ANYHEET control) in the cord to regulate the heat applied to the water. 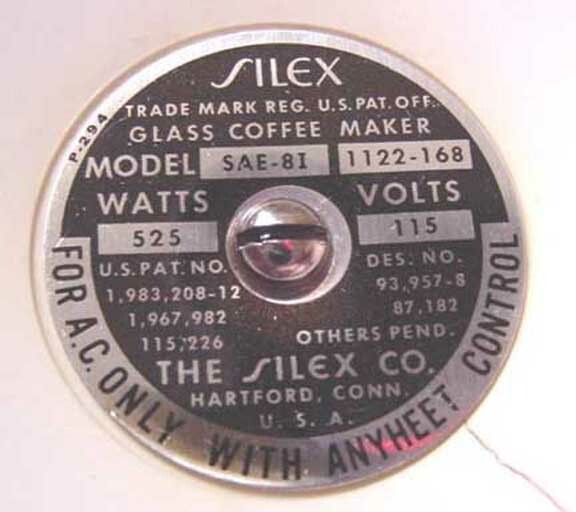 Since many remote communities only had Direct Current (DC), the manufacturer's nameplate makes it quite clear that only Alternating Current (AC) is to be used. 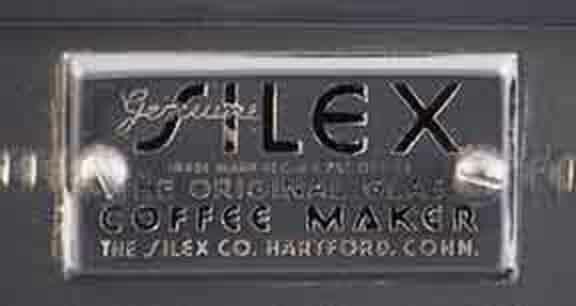 "..The Silex Hostess set was purchased (for $240.00) by the Connecticut State Historical Society. In the spring [of 2006] it will become part of a long term exhibit in the Old State House in Hartford, CT where it was made..."
Contact Us if you can help us know more about this fascinating object. 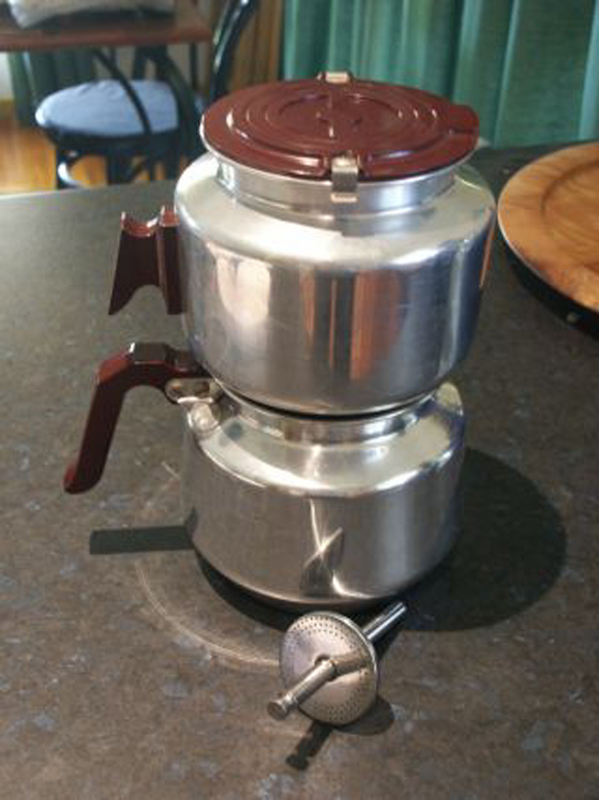 Here are some photos of a very lovely Silex vacuum coffee brewer sent in by our reader Kevin. He did a good job with the photos and even scanned in the brochure! Here is an interesting "fragment" of a Silex set that was sent to us by our reader Adam in London. 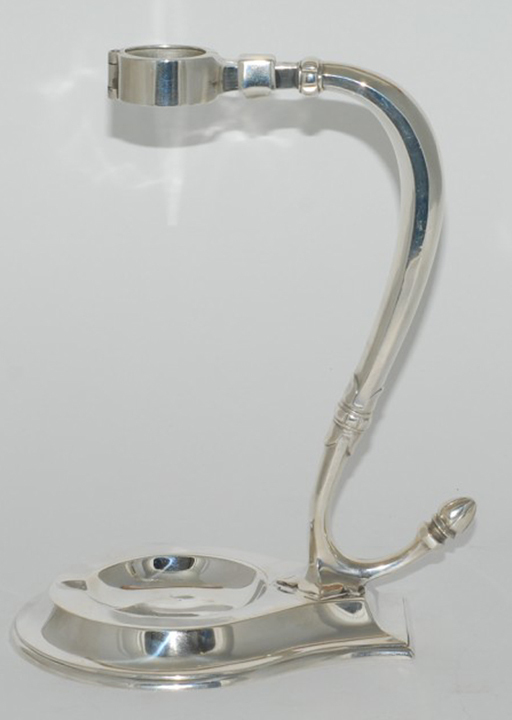 It is an elegant silver handle that once held the server (and brewing chamber) for a Silex Vacuum brewer. 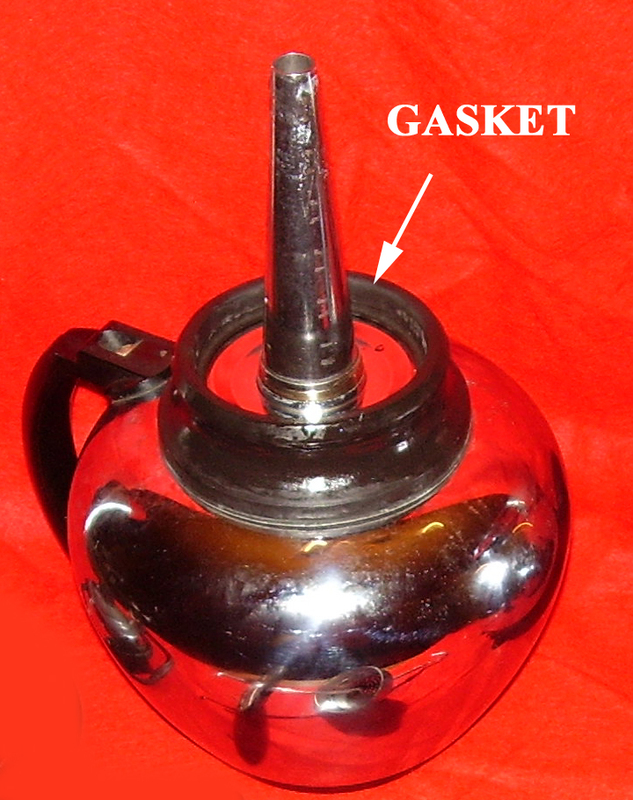 Since the glass was likely to break, the silver handle can be opened to replace the server. 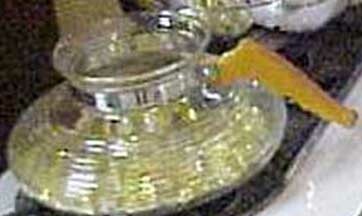 Also, the server can be removed for cleaning without exposing the handle to tarnishing soaps. 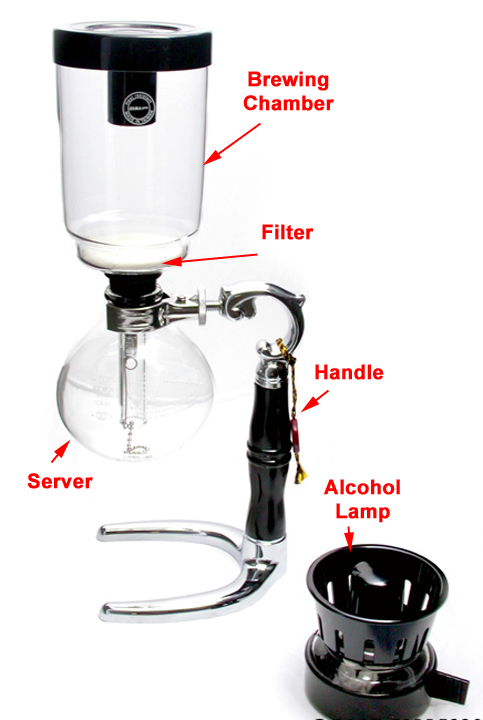 This is a very clever device that has its roots in 17th century "Syphon" brewers that use the vacuum principle. 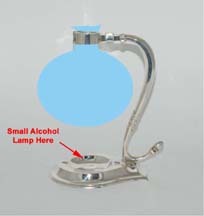 For this, an alcohol lamp provides the heat source. 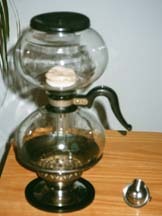 Currently, the "Yama Syphon Brewer" is being sold as a working replica of the antique "syphons". I have one and it is always an entertainment to make coffee at the table with it. 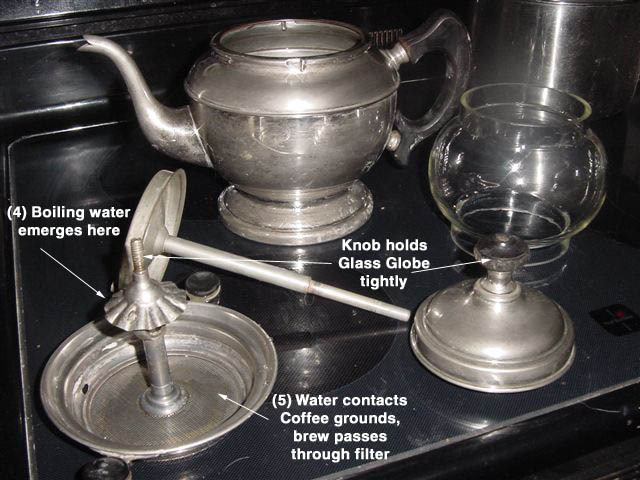 I can see a rig like the Yama using the silver handle being used to make demi-tasse at a fancy dinner. 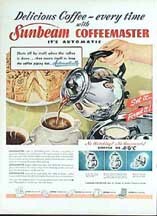 Click here to look at another type of collectible, or keep on scrolling for more Coffee devices. "...Could you help me identify this silex coffee maker? 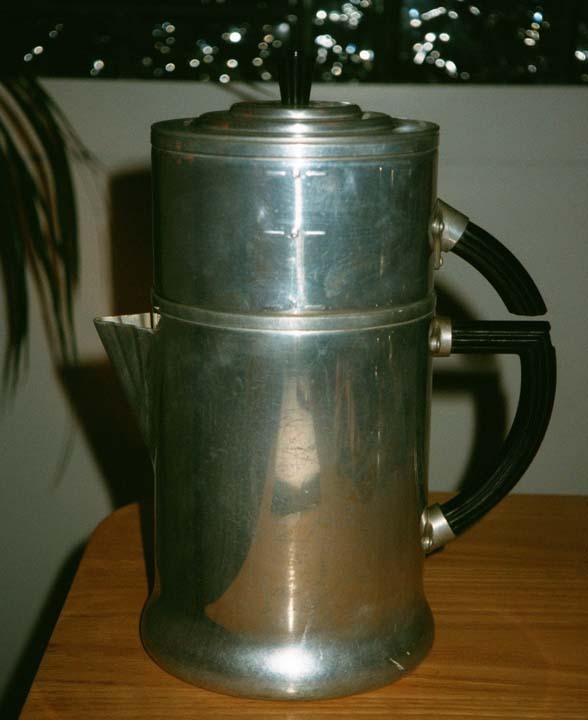 It was originally purchased for a coffee shop my grandfather had in lower Manhattan around 1930 and never used. 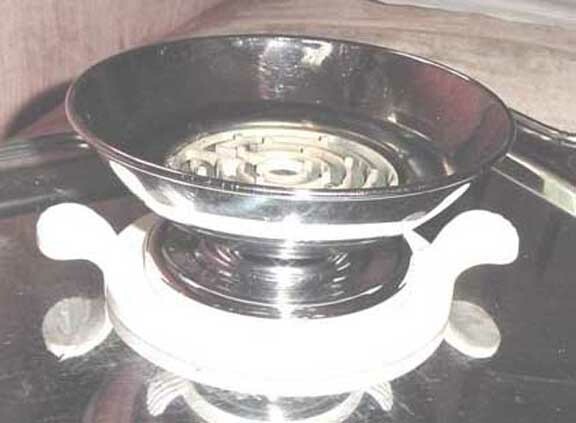 It's a gas four burner made of chrome with four glass coffee pots on top..."
Here is a picture of a three burner Silex set that was sent in by our reader John. He writes that it is still in service at Kortman's Restaurant, located in Rogers City a small town in Michigan. "... I've attached a few images of a Taft, Warren, & Taft coffee urn that was produced in the early 1900s. 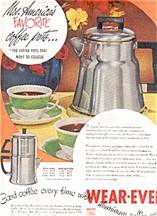 Taft, Warren & Taft was a Baltimore-based firm, long since defunct, that supplied Baltimore and Washington, DC hotels with restaurant supplies, including coffee urns, beginning around 1912. (That is when they showed up in the State of Maryland's Comptroller's tax records.) 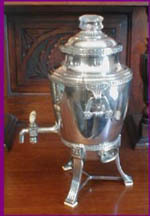 The urn shown is one from my private collection and is slated to show in a proposed exhibit onBaltimore wares at the Baltimore Museum of Industry. All of these urns wereoriginally nickel-plated top-to-bottom. 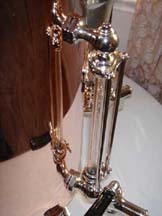 Now you see them only as copper and brass as the nickel wore over time, and owners opted to have the remainderremoved. I fully refinish my urns, plating all of the hardware, thoughleaving the copper chassis unplated. I happen to like the two-tone,three-tone look. 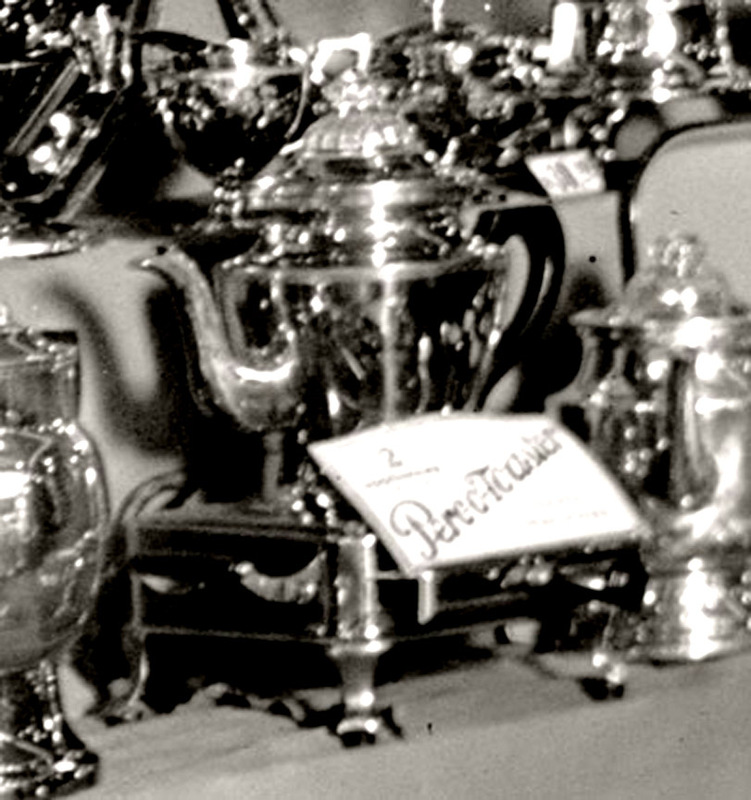 Several of our urns get used for family functionsincluding tailgate parties, clean-up well, and are always the subject of attention by coffee lovers. 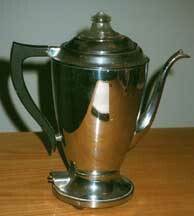 ..."
:...Now, regarding the coffee urn that one of your readers indicated was made in occupied Japan (O-J), I do have to take exception. It is an interesting story, however, I don't believe it is correct. 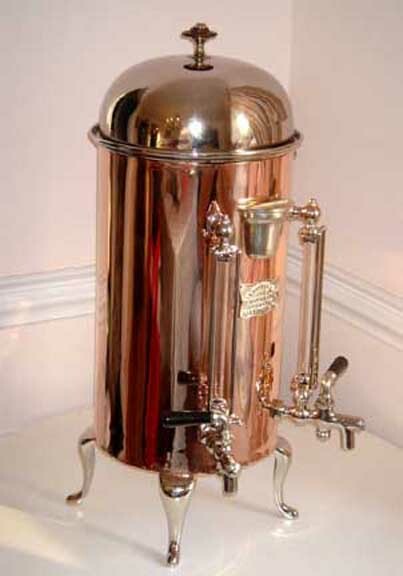 There were a number of U.S. manufacturers of coffee urns that were in production between 1885-1935 that produced this style of coffee urn (i.e., gas heated, ceramic insert for coffee, copper water jacket for heated water). Such urns ranged from 11-12" diameter to as large as 20-22" diameter (over 4 feet tall!). (I have one of the large ones in my basement, and my contractors often mistake it as an old water heater!) 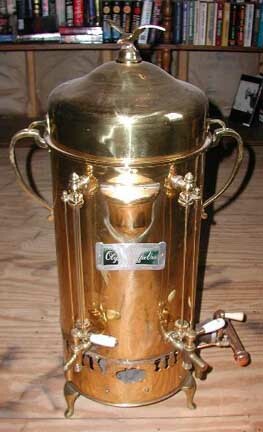 Now, regarding the O-J urn, I believe that the two wire handles on the sides were a later embellishment, as was the eagle on the top (to mimic an Italian espresso machine of the 1930s). 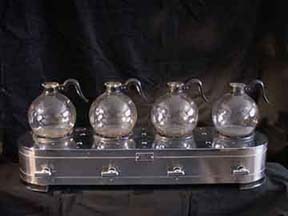 Additionally, post-WII urns had moved largely to aluminum in construction. 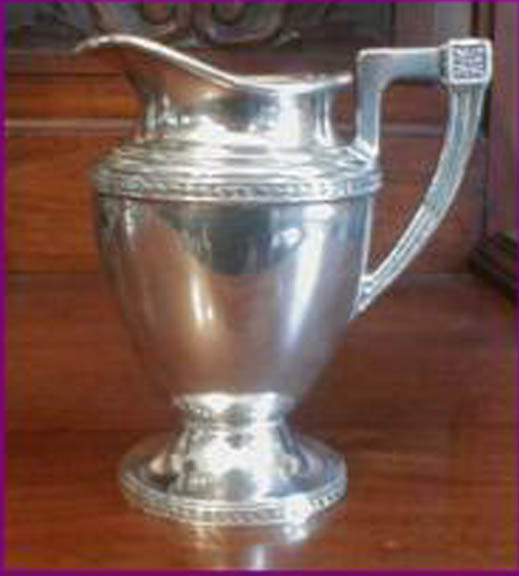 It is possible that the urn ended up in the Philippines in a nice hotel, however, I am almost certain that it was shipped from the U.S. pre-WWII. 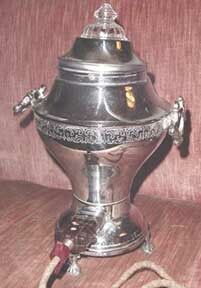 Additionally, I recognize the chassis of the urn and will try to identify the manufacturer at a later date. Likely it came from either New York or Chicago. 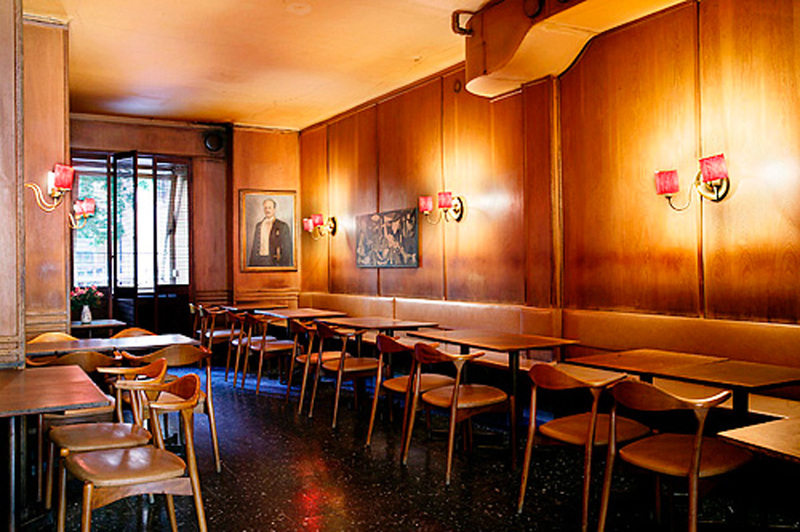 ..."
On the subject of commercial brewers, you might want to look at our page on Diner Talk, since a whole lot of the coded communications between waitstaff and the kitchen involves coffee. feel free to Contact Us if you can help us know more about either of these fascinating objects. Landers, Frary & Clark traces its start to the time George Landers, age sixteen, arrived in New Britain, Connecticut in 1829 looking for a job. He soon went to work for Josiah Dewey who, seven years earlier, had started a small foundry making cupboard latches and other hardware. After Dewey's death, it became Landers & Smith Manufacturing Company in 1853. As president, Landers' salary was seven hundred dollars a year. In 1862 the small but prosperous company made another of the many acquisitions that were to mark its history and growth in future years. It acquired the firm of Frary, Clark & Company, of Meriden Connecticut, the company name changed to Landers, Frary & Clark, which it retained for the next full century of its existence. 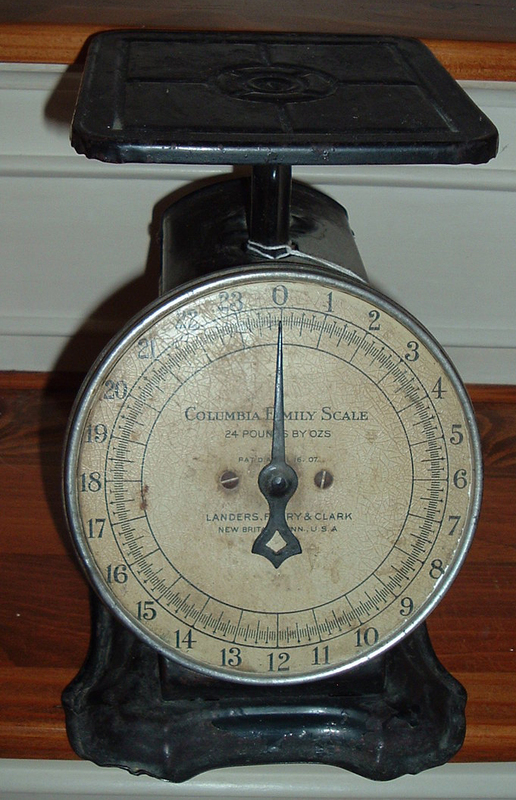 Probably the most important item introduced around this period was a household scale, "the first product designed particularly for the American housewife." 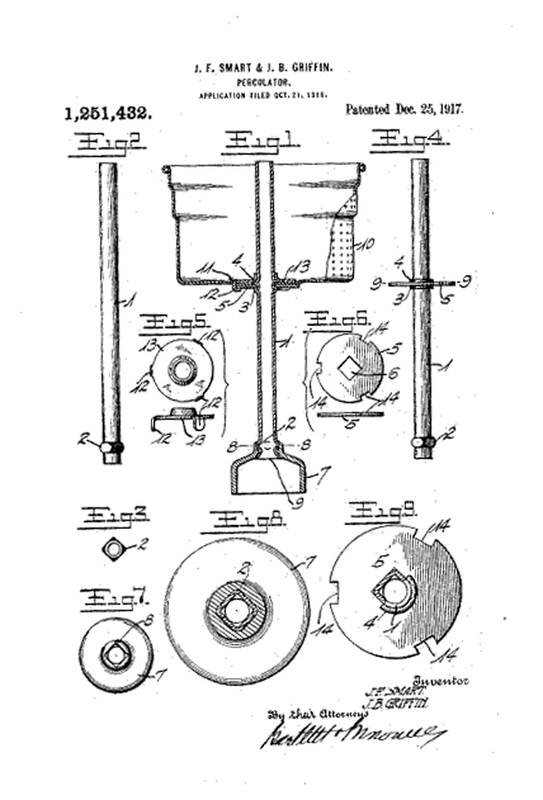 The company's productline continued to grow, adding meat choppers and sausage stuffers, screw eyes and strap hooks, door handles and floor scrapers, molasses gates and faucets, meat hooks and harness hooks, cast iron match boxes and curry combs, fancy brass hat hooks and eyes with porcelain knob ends--and even toys. In 1870, George Landers, having turned fifty-seven, decided to retire from active management, but to stay on as vice-president and director. His son was now secretary of the company. 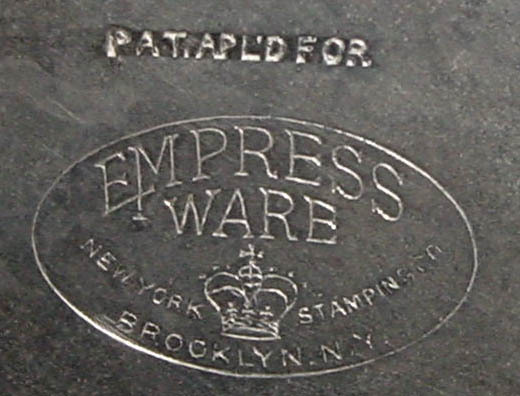 In the 1890s the trade name "Universal" was adopted for the company's products. And it was in the same period that it introduced a series of quite revolutionary household products that were to help establish it as a leader in the housewares field. 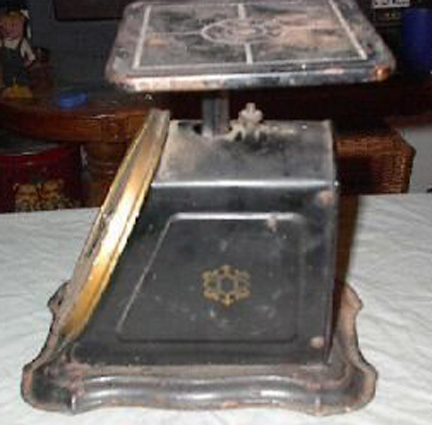 One of these, was the "Universal" bread maker in which dough was prepared in the evening, left in the machine to rise overnight, ready for baking in the morning. 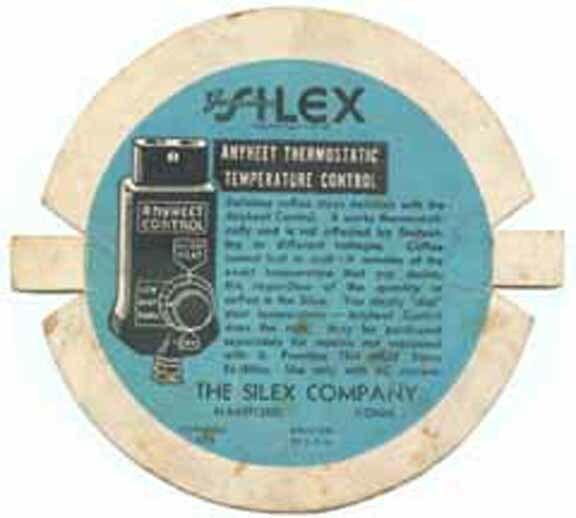 This product quickly became one of one of the mainstays of the company. 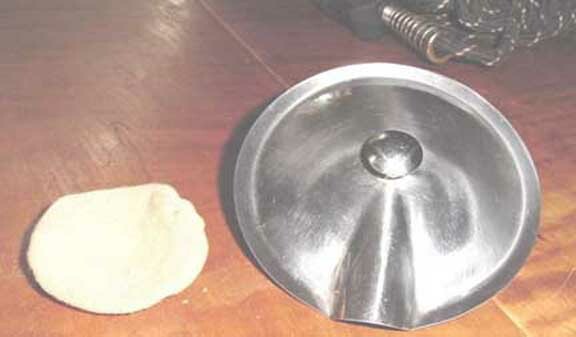 The second product to become a household necessity was the "Universal" food chopper. 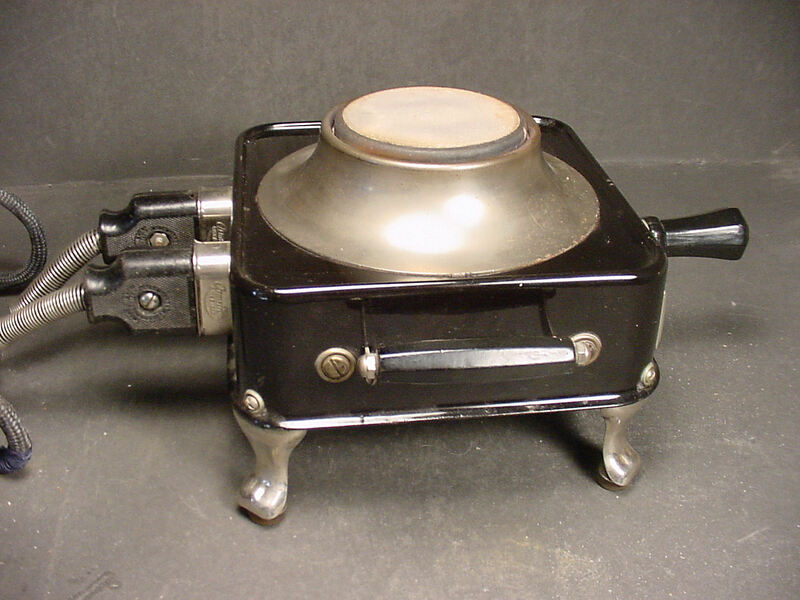 Choppers were not new, but this one ground not merely meats but vegetables as well....Odds and ends could be turned into hashes and casseroles with ease....The identical model food chopper first produced in 1897 was an active item in their line nearly 100 years later. 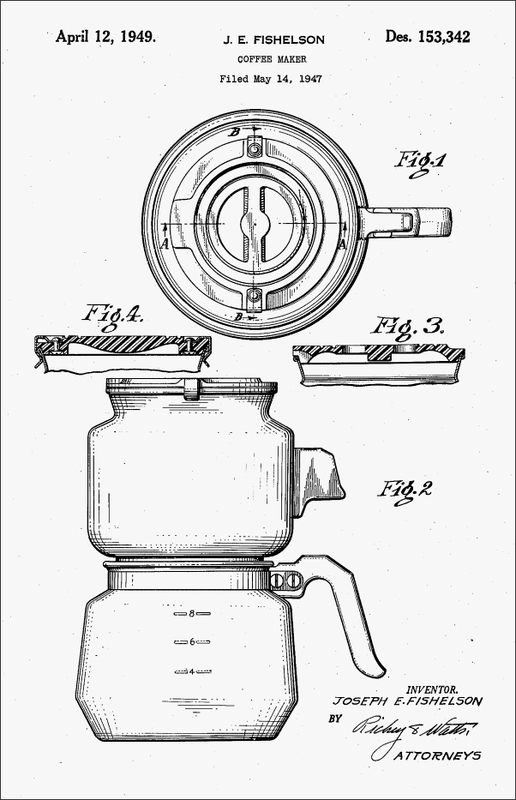 The third, and to us, the most important product introduced during this period was the "Universal" coffee percolator (first produced in 1905), offering a new method of brewing coffee without boiling it, with resultant improvement in clarity and flavor. 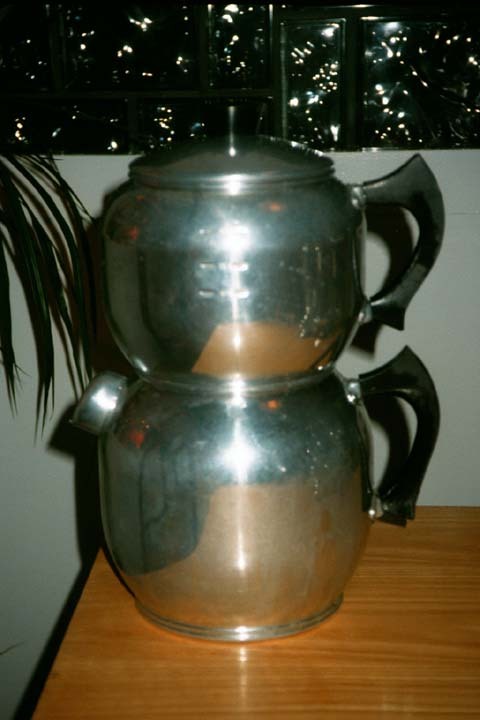 For most of the period from 1900 to 1980, percolators outsold other types of coffee makers. This percolator of the nineties was a simple one, heated on the stove. The day of electricity was only dawning. A stock clerk named Charles F. Smith had gone to work for Landers in 1882, and in 1900 on the death of Charles Landers, son of the founder, he was elected president. Until his death in 1938, Smith was responsible for the tremendous growth of the company. 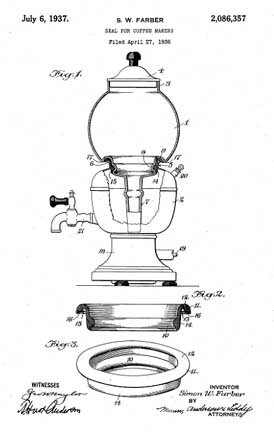 Beginning with a patent it received in 1908 for the development of an electrical unit to be used on percolators, the company moved head-on into the appliance field. 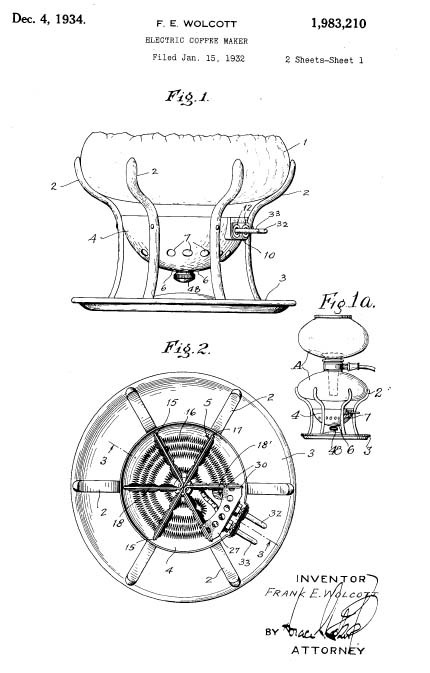 The first "Universal" appliance appeared in 1912 when a "thermo cell" electric iron was introduced. 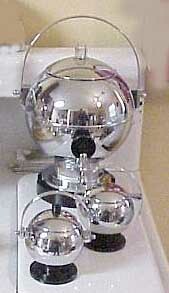 Percolators, toasters and ranges soon followed. 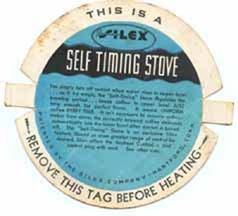 By 1915 it was already making electric ranges. Then came World War I when all production was devoted to military needs. 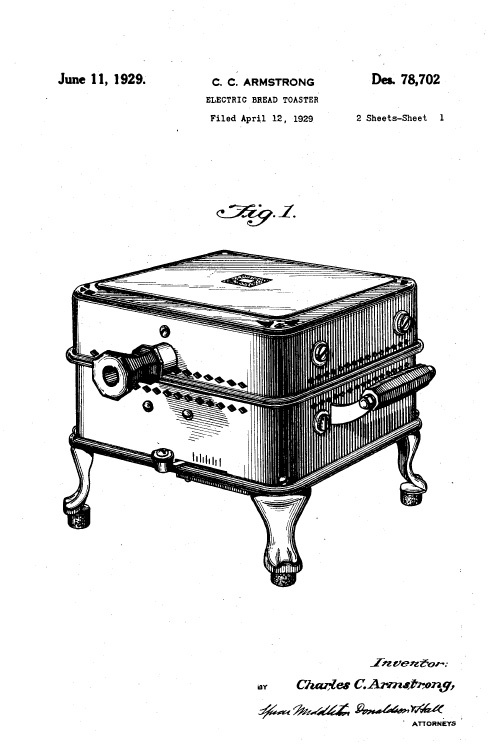 After the war the company greatly intensified its entry into electrical household products, an era Richard White referred to as the second or "electrical phase" of its development. "Today , while Landers is manufacturing many non-electrical products for the home, its principal products are in the electrical field," he said. 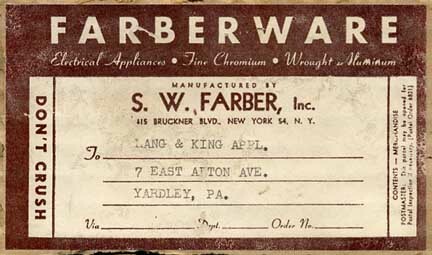 It is noteworthy that in the early 1920s Landers, in order to exercise more complete quality control over its appliances, adopted a policy of making all its own parts as far as possible. 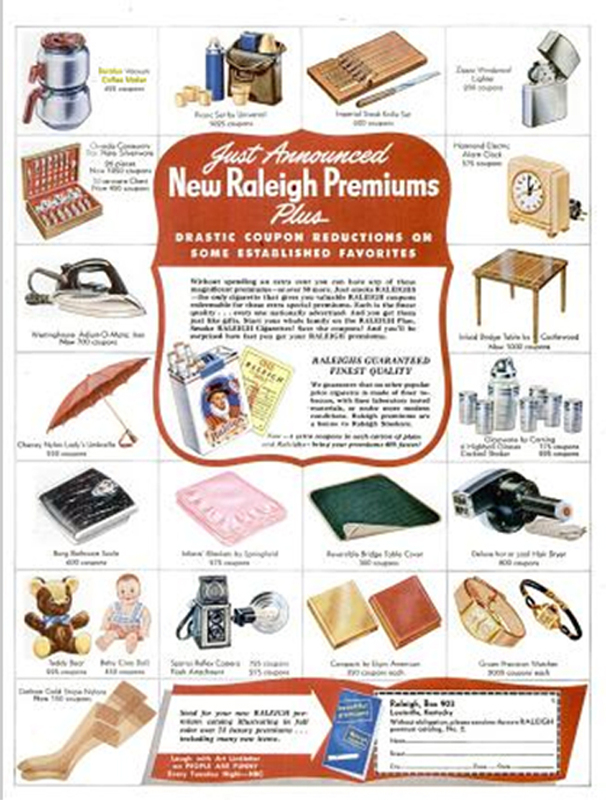 At the time it claimed that six out of every ten homes in the country had at least one "Universal" product. Its capitalization in 1923 had reached $10.5 million and it employed over three thousand people. The company also grew by acquiring other organizations: In 1919 the Barnes & Kovell Company was purchased. 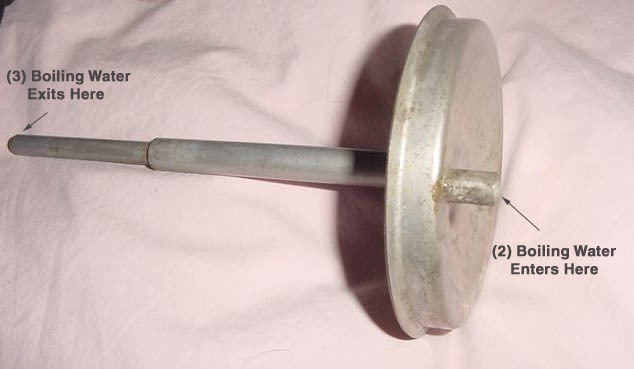 In 1920, the Columbia Heating Pad Company and in 1940, the O-Pan-Top Manufacturing Company, producers of a top-opening carpet sweeper, joined the "Universal" line. Throughout the many years of its growth Landers had developed a conservative, intensely quality-minded image; here, it seemed, was a company so solidly rooted "it'll go on forever." So in 1950, when it announced the discontinuance of its cutlery division after eighty-four years of operation, the trade was shocked. Landers, they would tell you, acquired businesses--it didn't drop them. Alas, Landers, Frary and Clark went out of business in 1965, a victim of cheap and cheesy imports. 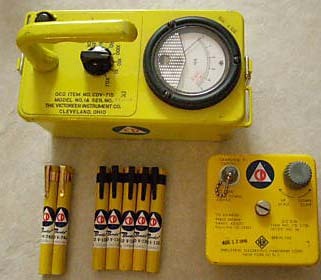 However, LF&C did not go down without a fight -- at the height of the Cold War, they began manufacturing geiger counters for the US Civil Defense program. 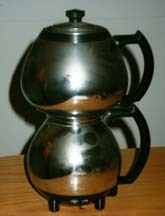 I just purchased a coffee pot that is made of aluminum,. 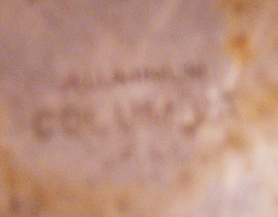 The bottom of the pot is marked "Columbia, L. F. & C ". 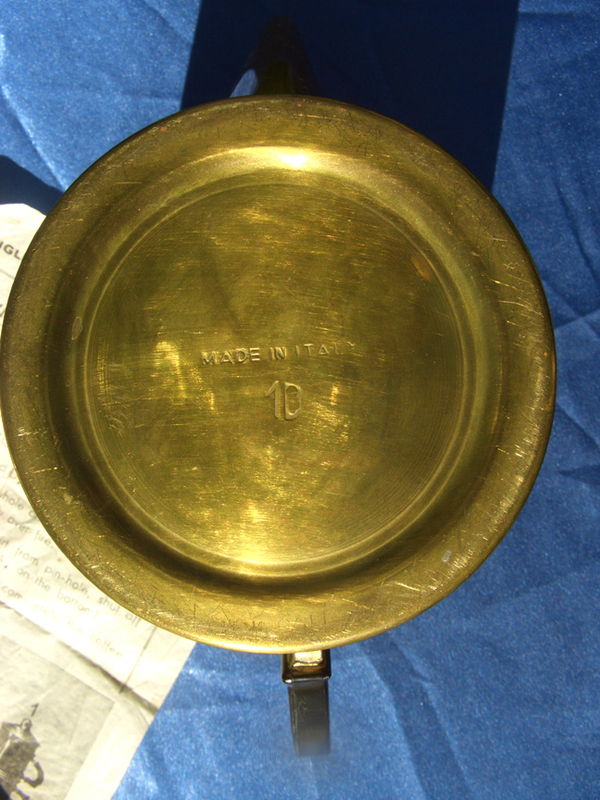 The percolator basket is marked in large type "Columbia Landers Frary". Under thisin smaller type is "Bte S.G.duG No.369482-D.R.G.M. NO.271,098 No.159 PAT'D. MAY 22, 06. JULY 16,07. JAN 28,13." I am attaching pictures. 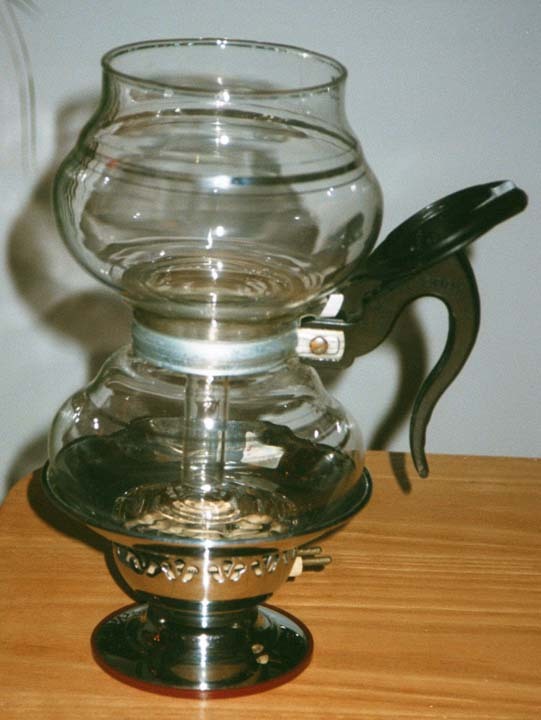 Do you know anything about this particular coffee pot? 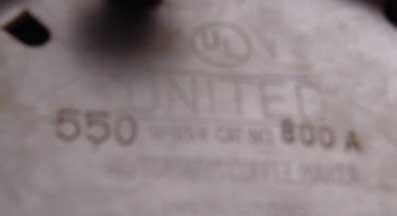 I have looked and the only LF&C brand I can find is "Universal" with no mention of "Columbia" only Universal. Any information you can give me to find out how old this is would be appreciated. 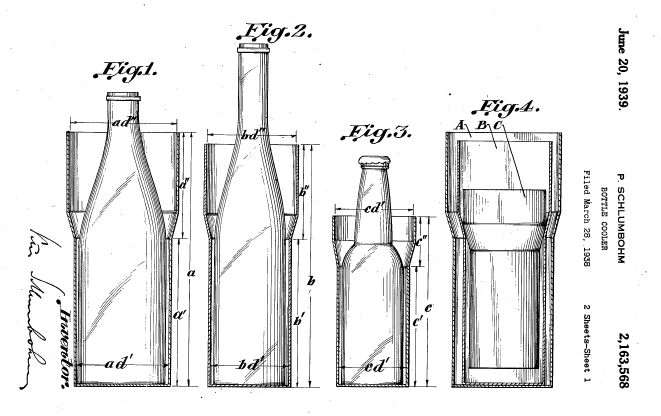 According to the Patent office, the "Universal" trademark dates from 1890, although your piece had to have been made after 1913. 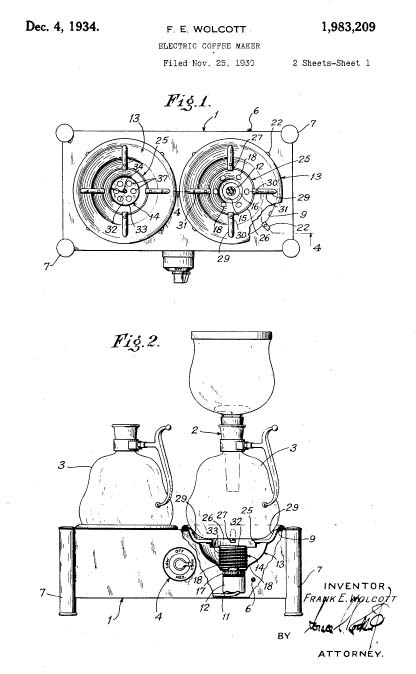 I did some patent searching and discovered that LF&C had designed an electric percolator by 1912, and had an improved percolator basket by 1916. 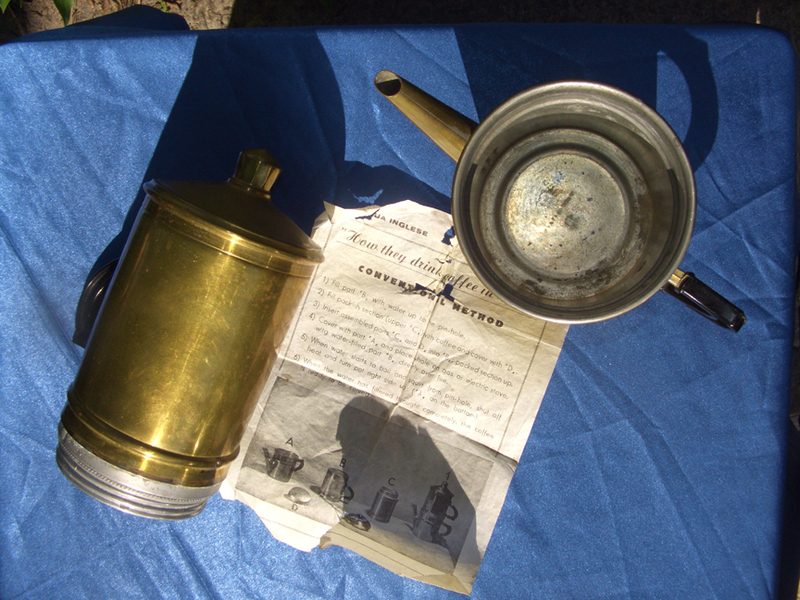 My best guess at this time is that the coffee pot dates from the time of World War I. (maybe 1914-1916). It looks like LF&C may have marketed some items under the "Columbia" name before branding all its goods as "Universal". That's only a guess and I invite comment from knowledgeable readers on this subject. Add the highly concentrated extract (1 ounce) to a cup of hot water.. If stored in a sealed glass jar this extract will last a month or more, according to the instruction book. The price of the Filtron was $19.50. " This photo was sent in by the noted 40s Phil of central Indiana. Phil writes: "This is a 1940 G.E. top of the line coffee maker Cat. No. 129P8. 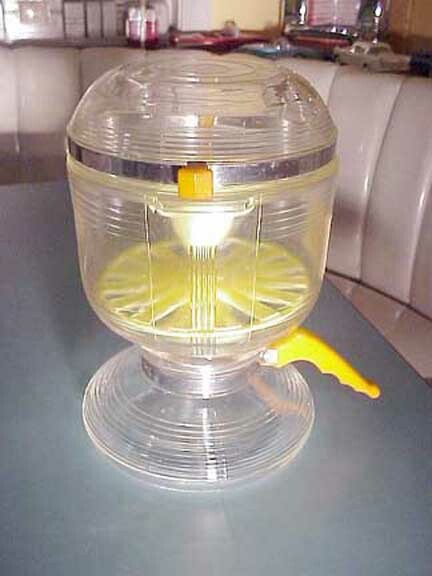 It's a vacuum type machine. What an incredible mixture of glass, chrome, and bakelite. This one is in mint condition "
"...[I think] that the GE 129P8 is the coolest glass vacuum coffee maker ever. I have two of them and they are both in "like new" condition. After [discussing this with a reader] I got the hankerin' to make some coffee with one of my 129P8s. I discovered that neither one of them works. When plugged in, the pilot light comes on but when the red button is pushed the pilot light stays on and nothing happens. I have a feeling that the magnetic trigger in these coffee makers did not last long. That explains why my GEs are in such excellent condition ... they quit working early in their lives so were not used much. I have an extra stove (heating unit) for a GE 129P18 (that is the post WW II GE model which is a face-lifted 129P8). That stove does not work correctly either. I did get it to go on 'Hi' heat by holding the button down with my finger. 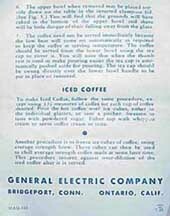 I ran it through a coffee making cycle (using just water - no coffee) and discovered another good reason not to use these GEs for making coffee. 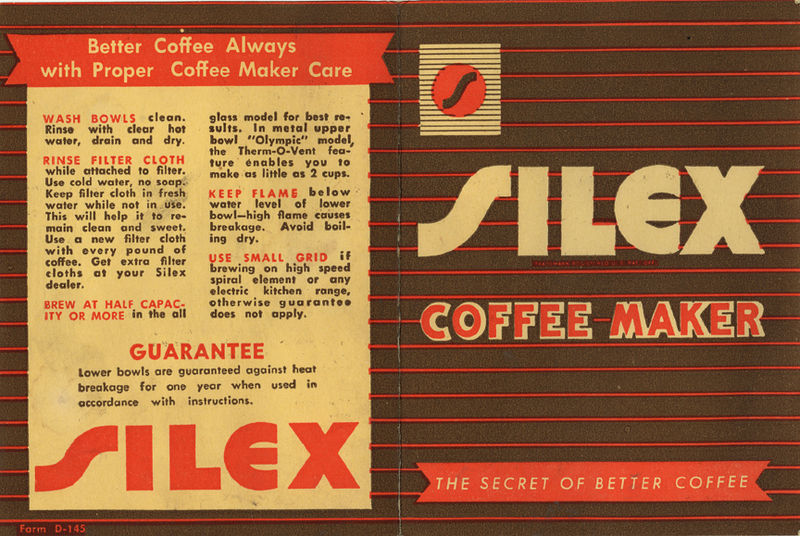 The boiling water and steam in the upper bowl caused the bakelite lid to give off a burnt bakelite odor and that odor was present in the cloth coffee filter when I cleaned the coffeemaker after the experiment. 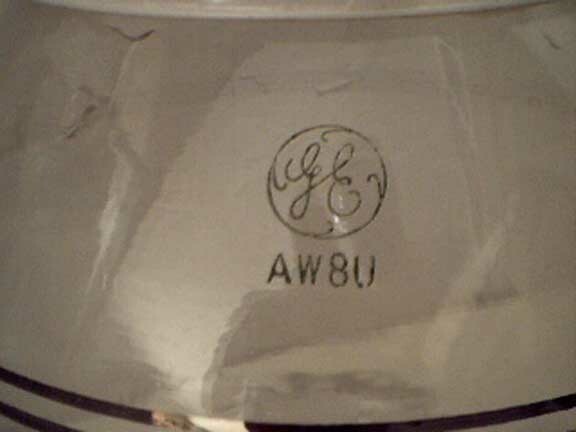 Also, one of the rubber feet on the upper bowl lid stuck to the inside of the bowl during the test run. If you do get your 129P8 working, I would recommend that you leave the lid off while making coffee. I'm going to try to dis-assemble one of the 129P8 stoves to see if I can get it working properly. 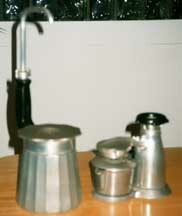 ..."
The Neapolitan flip coffee pot, or Napoletana, is a drip brew coffee maker for the stovetop. 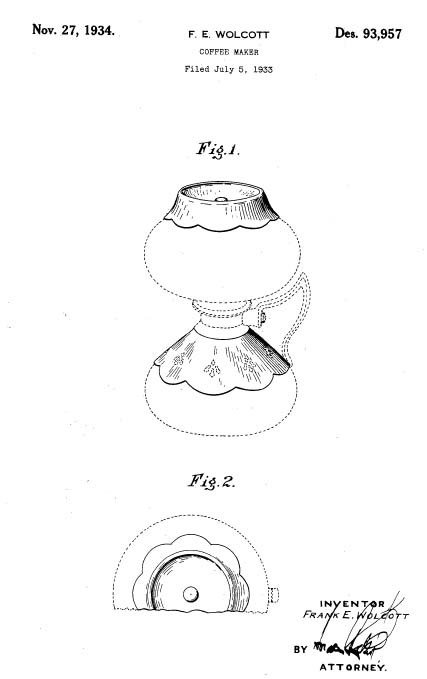 It consists of a bottom section filled with water, a filter section in the middle filled with coarsely ground coffee, and an upside-down pot placed on the top. 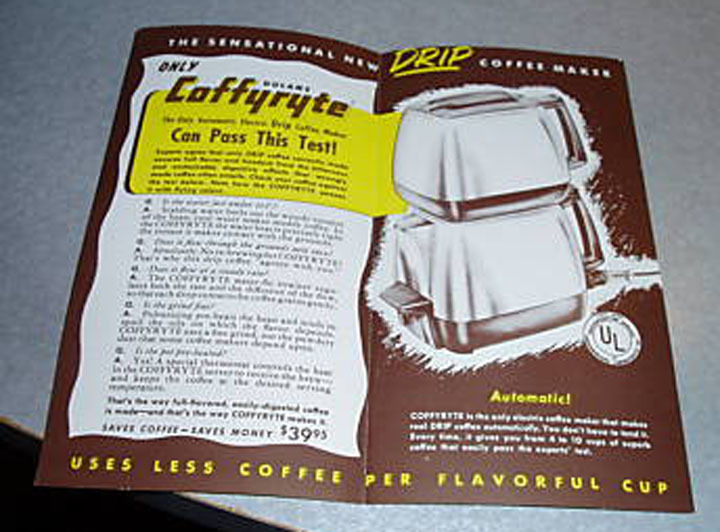 When the water boils, the entire three-part coffee maker is flipped over to let the water filter through the coffee grounds. 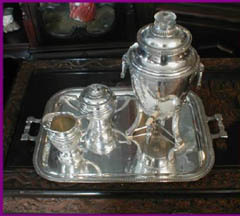 Once the water has dripped through the grounds, the water-boiling and filter sections are removed, and the coffee is served from the remaining pot. Because of the coarse grounds, the coffee is brewed quite mildly. Using a very dark, finely ground roast, in the "Neapolitan" style, this method can produce a coffee that has a stronger flavor than an automatic drip maker. "... 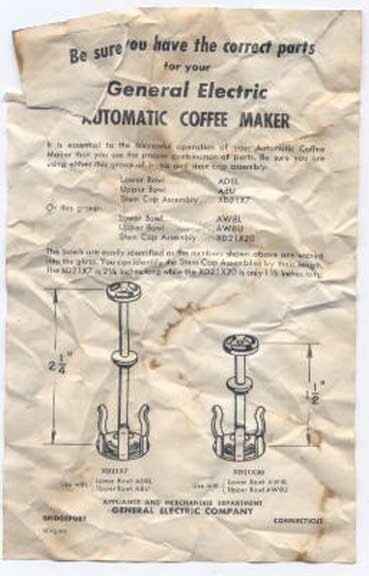 I found this coffee maker from Italy and I need some advice on how to use it..."
Click Here for instructions on how to use the Napoletana. FIRST: Water in the server drains into a small well at the bottom. A heat source (e.g. 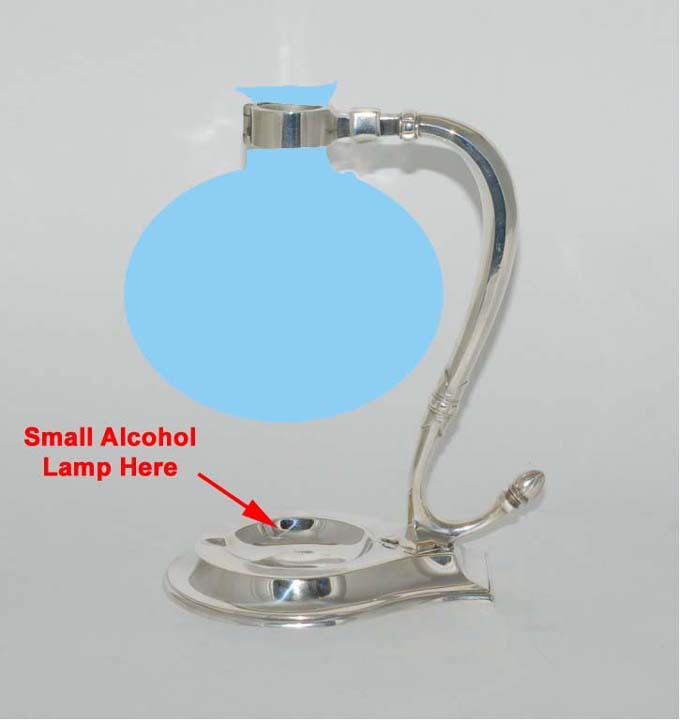 alcohol lamp) is applied to boil the water in the well. The wood handle indicates that this was probably not used on the stovetop. 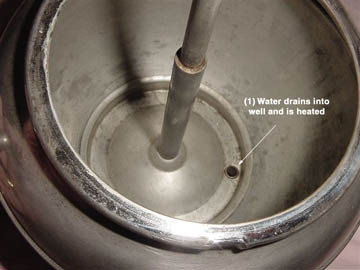 SECOND: hot water passes through the support tube and is carried upward into the brewing chamber. 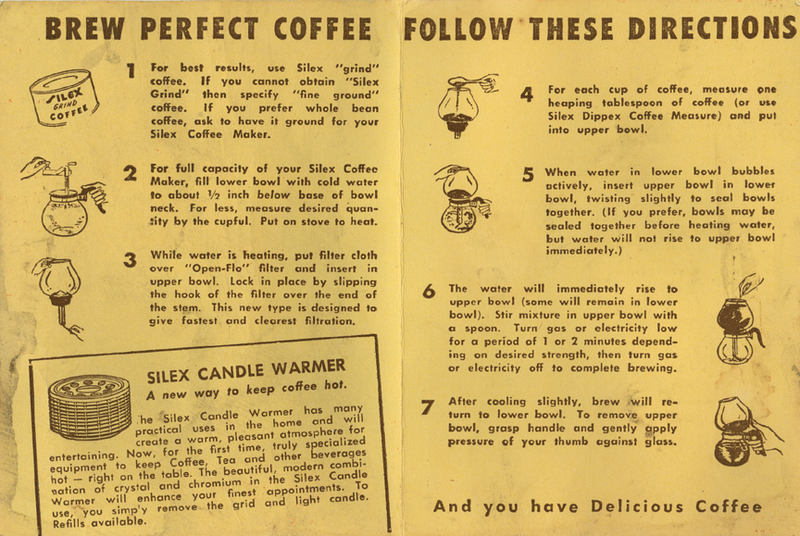 These photos were sent in by our friend Pru, who seems to find al lot of coffee oddities. Thanks, so much, Pru! This photo was sent in by the noted 40s Phil of central Indiana. Thanks, so much, Phil! Of all things, Manning-Bowman is not as collectible as Chase --- this set only has a value of about $300! 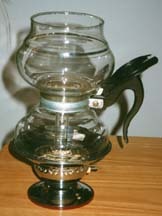 The Chemex is a beautiful object --- a hand-blown double cone of glass that serves as both coffee brewer and server. 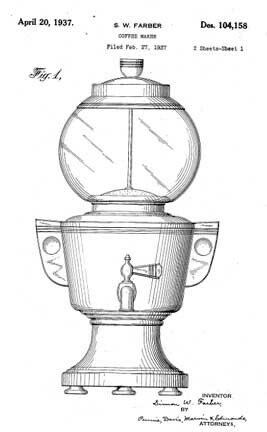 The upper cone holds a filter; ground coffee is placed in the filter and hot water poured therein. 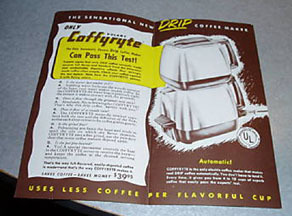 The brewed coffee drips down into the lower cone. 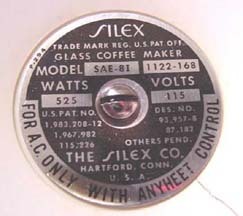 The filter is removed and the device may be used to serve the coffee. 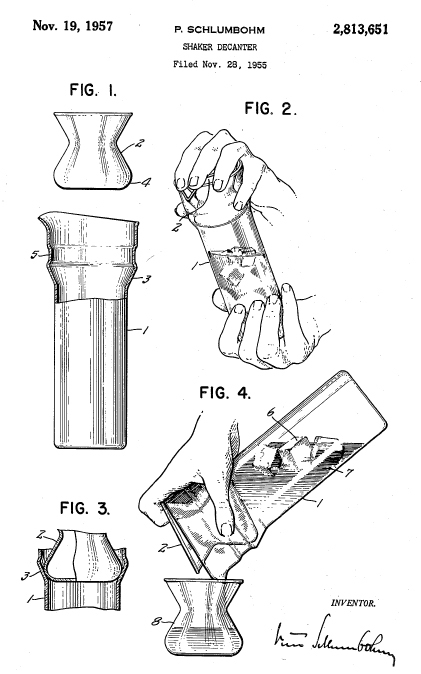 Because the glass gets very hot, there is a wood grip, made of two curved pieces held together with a leather thong. A wooden ball/toggle is used to cinch the pieces together, but it can be loosened to remove the grips so that the device may be cleaned. Before my family moved to the Suburbs, my dad would only drink espresso and it had to be made very precisely --- every day, on the way home from work, he walked by the Nicholas Coffee warehouse and came home with a small bagful of fresh roasted beans. 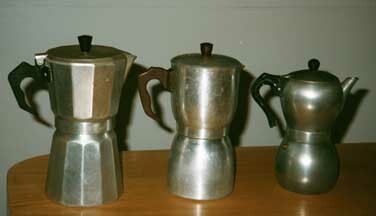 After dinner, he would grind these with a hand mill and make espresso on a Vesuvio stove-top apparatus. Although we were dirt poor, we enjoyed very good coffee. 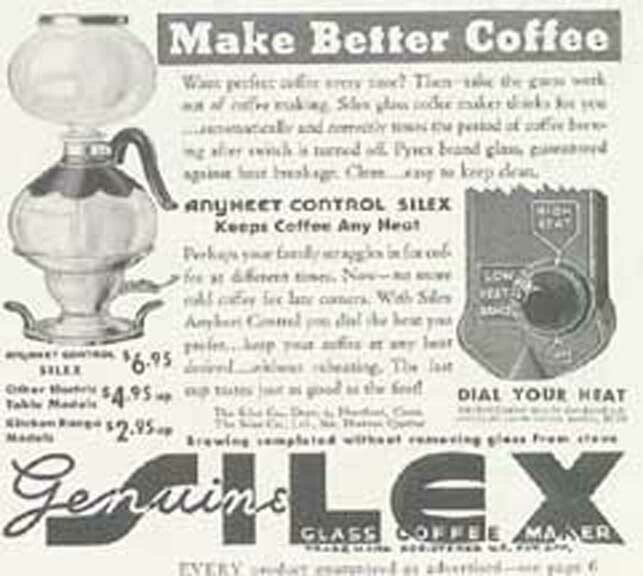 After that, the Chemex was sentenced six years in the back of a cupboard for being inscrutable to suburban housewives. 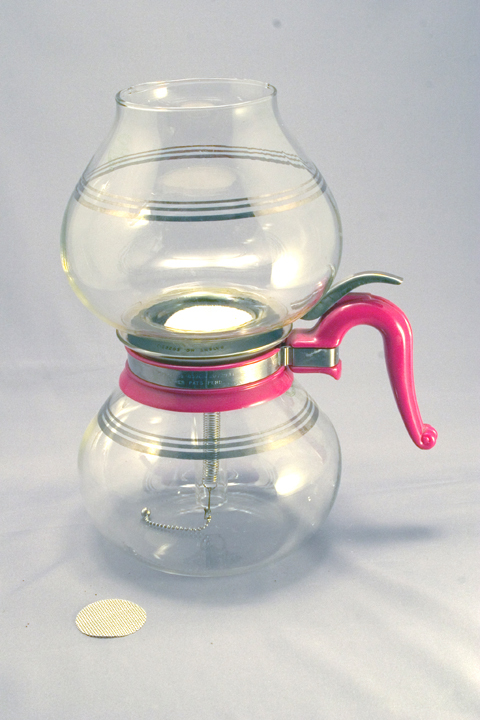 Then, I visited the Museum of Modern Art in New York which has a small exhibit of the great design innovations of the 20th Century --- among them is a Chemex coffee maker, a dead ringer for the one above our stove. 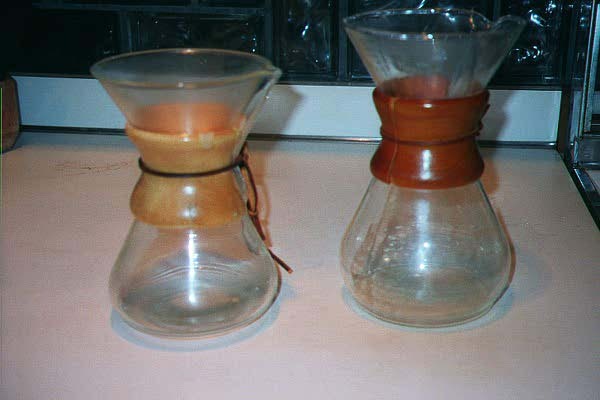 When I got home, I was able to rescue the Chemex and take it back with me to College --- a Museum Piece. I treasured this object, my very tenacious link with the fashionable people who frequented the Museum of Modern Art. 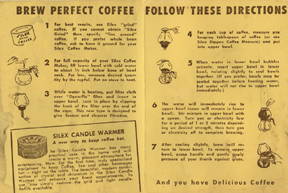 "...two large cups of black coffee from De Bry's in New Oxford Street, brewed in an American Chemex (and no sugar). A single egg, boiled for three and a third minutes. Thick slices of wholemeal toast, with Jersey butter; Tiptree 'Little Scarlet' strawberry jam, Cooper's Vintage Oxford marmalade, and Norwegian Heather Honey from Fortnums...."
You can buy any of these items except coffee from de Bry's -- the store closed in the 1980s and the building is now a computer store. Some calls to friends in London revealed that Jamaican Mountain Blue coffee is a good substitute for De Bry's celebrated brand which also came from Jamaica. In the books, Bond ---the force for Good --- had a preference for the handmade and the personal. The villains had a predilection towards Technology. 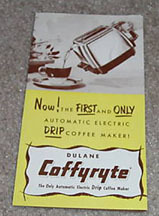 One could imagine either Bloefield or Dr. No showing off his "Mr. Coffee" device. 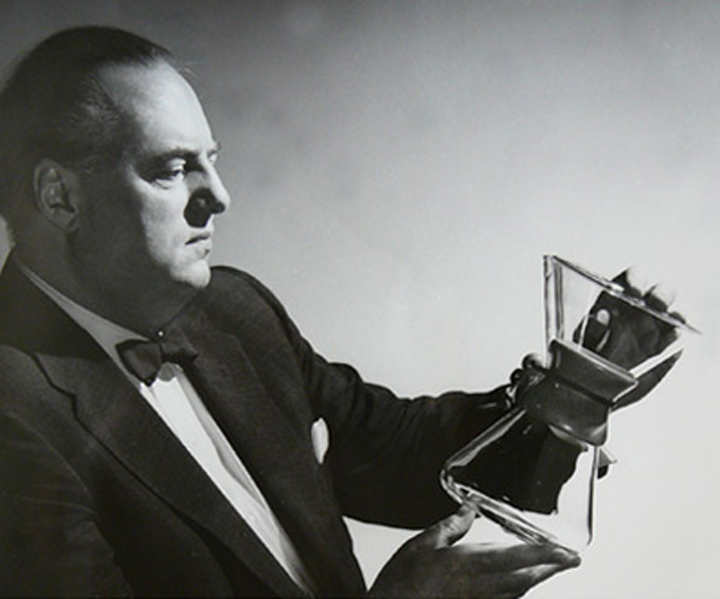 The Chemex Coffeee Maker was invented by Dr. Peter Schlumbohm who was a real chemist who has an interesting life story, as told in Gourmet Magazine. 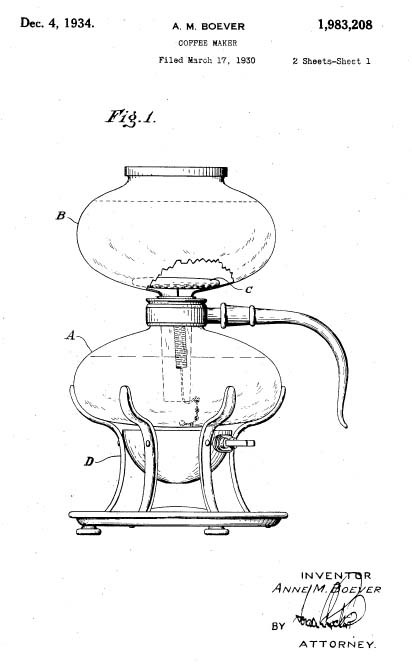 We have reproduced (above) the patent diagrams from some of Dr. Schlumbom's other inventions as discussed in the Gourmet Magazine story. 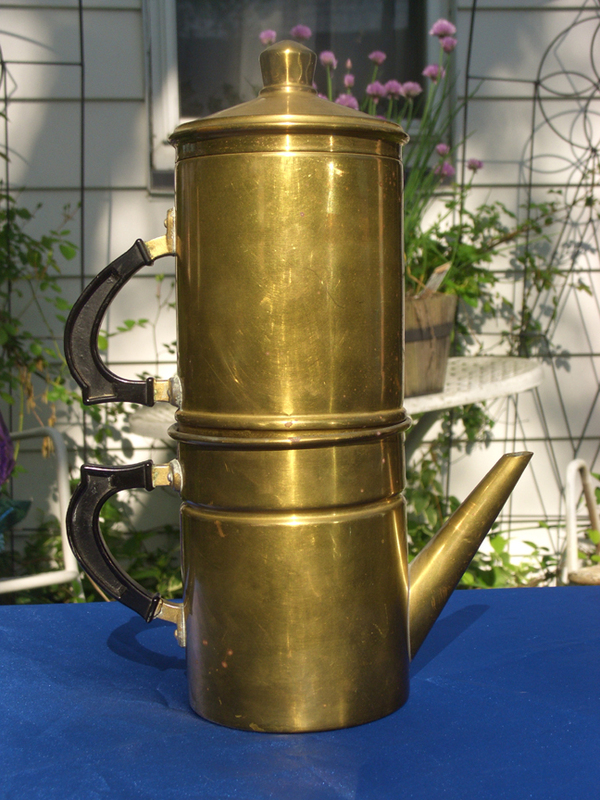 This is one of the more popular collectible coffee brewers. The thing works very well, especially if you have to brew a large amount (like 15 cups...) in a short time. The distinctive curved handles and gently bulging shape are very attractive. 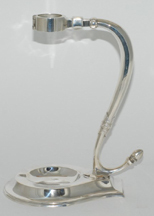 The device uses an internal metal filter that is very well-designed. I have seen these at $100 and over. 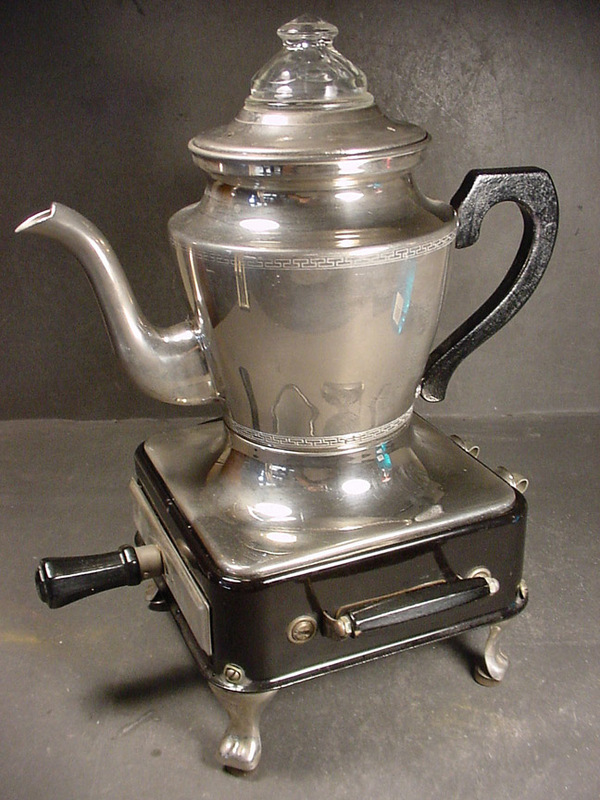 This coffee maker is eminently collectible for the cylindrical shape and the "Dee" shaped handle. 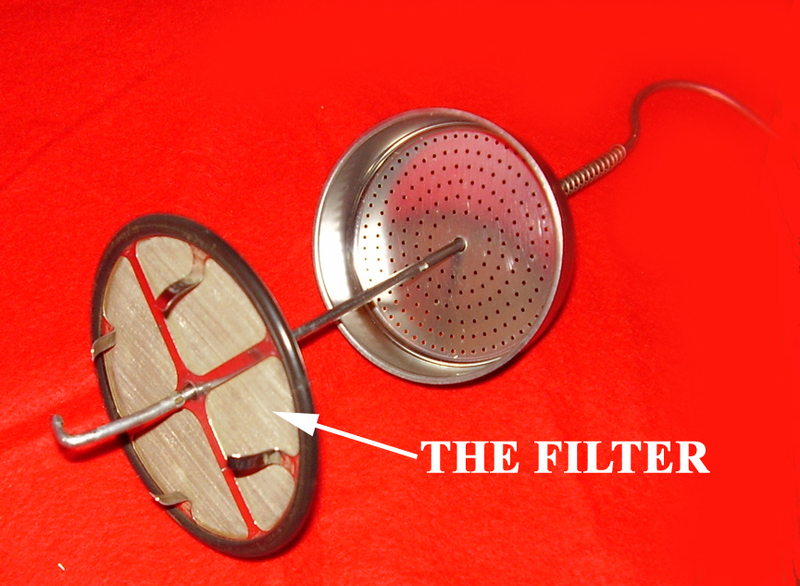 This utensil employs a paper filter in conjunction with the metal filter. I was very fortunate to find this as new old stock --- I have the original cardboard sleeve with the initial price ($0.75) written in black crayon. 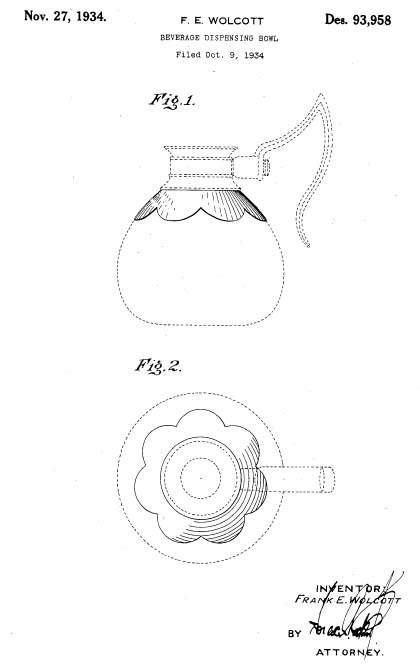 The piece dates from June of 1935 when the original design patent was issued. Wear-Ever got started near Pittsburgh, Pa. In 1901, USAC formed "The Aluminum Cooking Utensil Company" (TACU), as its marketing subsidiary. In 1904 TACU adopted "Wear-Ever" as its trade name. 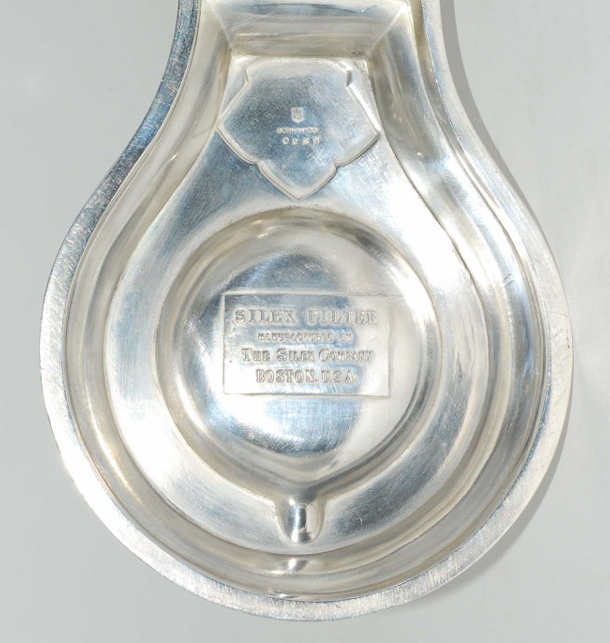 These products won a prize at the St. Louis World's Fair, and in 1912, Wear-Ever aluminum utensils became standard issue for the U.S. Marine Corps. By 1925, USAC had become ALCOA and Wear-Ever became the name for TACU. If the mark says "USAC", the piece is from before 1901; if it says "TACU" it's between 1901 and 1925; if it just says "Wear-Ever" it's after 1925. We note that Anetta Brenneman identified herself as an employee of TACU. 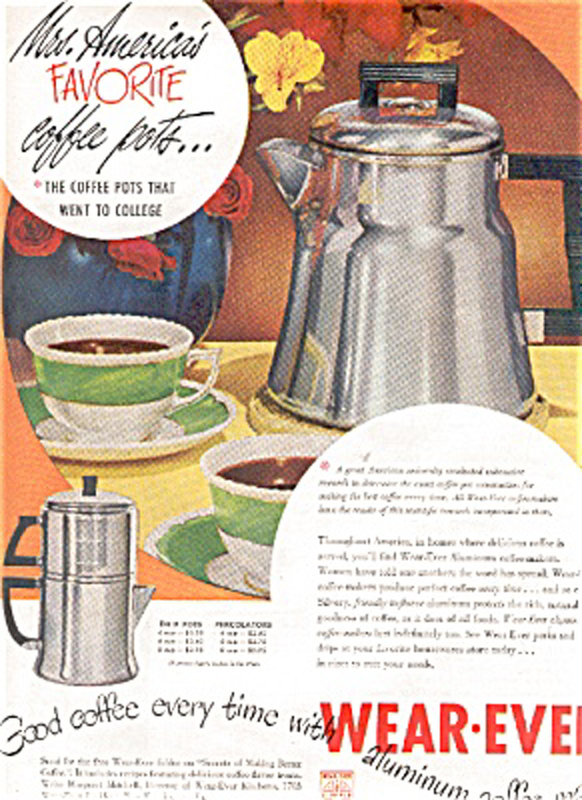 "The Coffee Pot that Went to College"
Above is a 1940s ad for Wearever products, including our little drip coffee maker. The motto is "The Coffee Pot that Went to College". 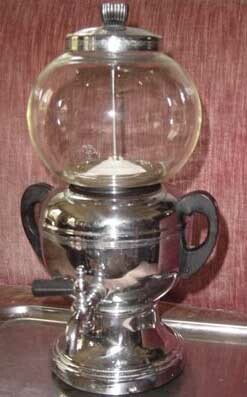 This is an absolutely beautiful hand-blown vacuum coffee maker from the 1920s that was made by the Silex company which specialized in making heat-resistant glass vessels for industry. 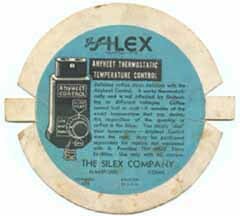 In the 1930s, the company merged and became Proctor-Silex, then Hamilton-Beach-Proctor-Silex, then Scovill Industries, etc, etc,etc. This is catalogue model EC-10, and made TEN cups. 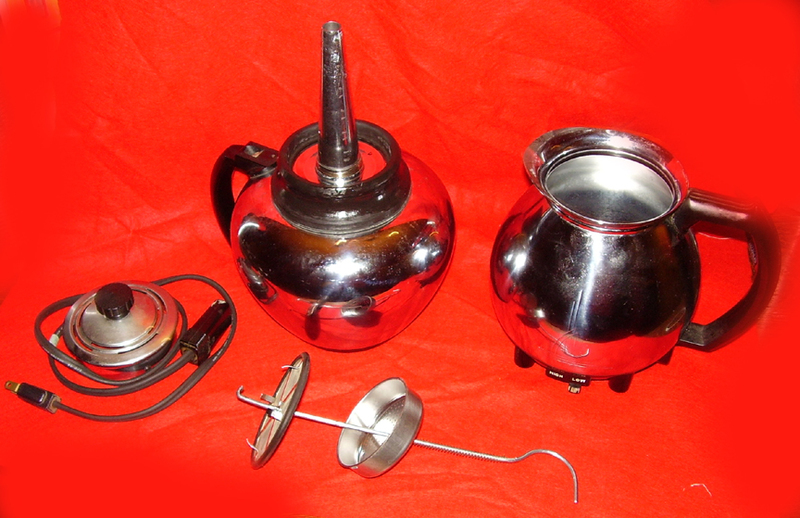 The upper (disassembled) view shows the various components: At the far left is the heater "stove" which is simply a resistance coil mounted on an attractive metal stand. In the center is the Upper portion (resting upside down). The vacuum lock and a cheesecloth filter are in the foreground and the server is shown at far right. The fully assembled brewer is shown in the bottom photo. 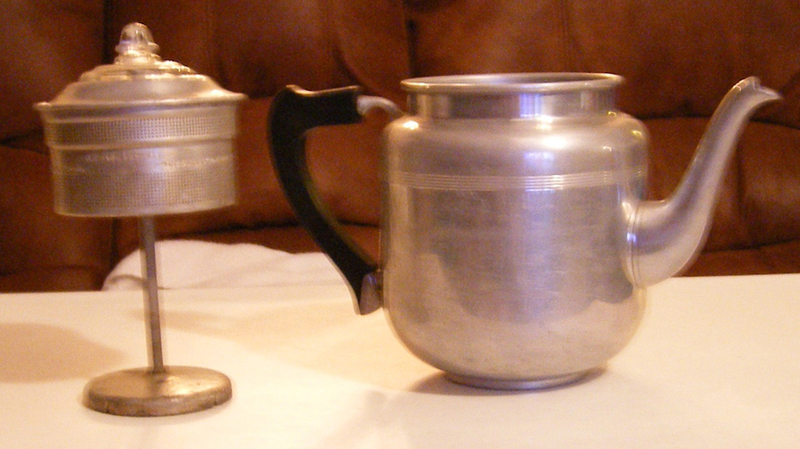 The small metal object on the right is the cap for the server when it is used at the table. This is NOT automatic --- you have to keep an eye on it to judge when all the water has passed into the upper chamber. 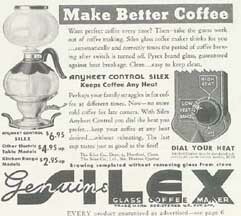 This is the eight cup version of the Silex Vacuum coffee maker (Catalogue EC-8). The Sunbeam came with an attractive tray set. While returning from the Reading Air Show, we stopped at a roaside flea market, and what should appear (for a quarter) but the tray!! This is a high quality, well-made product. 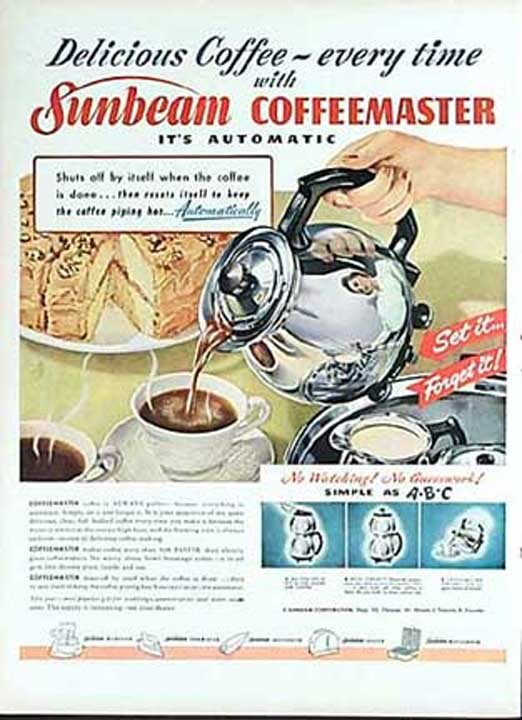 The principal design flaw resulted because Sunbeam did not expect that the product would have such a long life. The seal between the server (bottom part) and the reaction chamber (top part) is made of rubber. Over time, this changes composition and hardens. If the reaction chamber is in the Server, then you cannot get them apart. If the two parts are separated, the gasket will not compress and you cannot put them back together. The photo on the right shows the C-30 filter assembly. My version has a brass filter screen. Earlier models have a cloth screen. At one time, Sunbeam sold replacement filter cloths, but these are now unavailable. 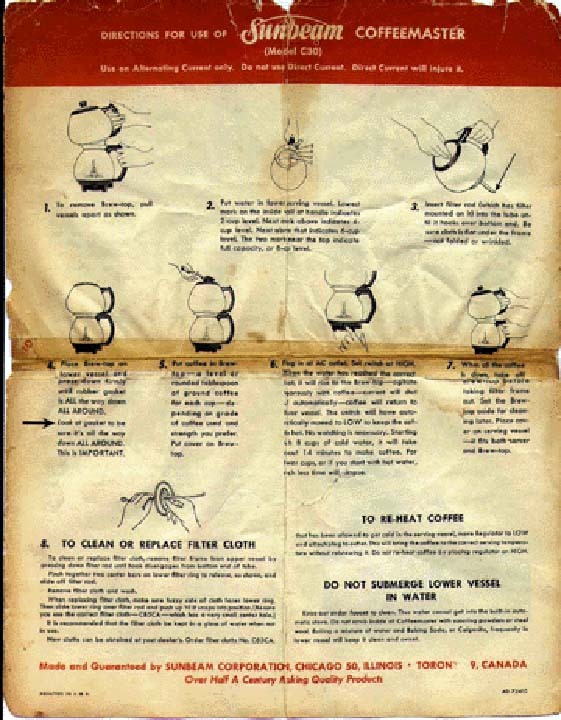 You will have to get some unbleached muslin and sew your own. The most frequent C-30 question that I get is: "How do I get the two pieces apart?" My answer used to be "YOU CAN'T." 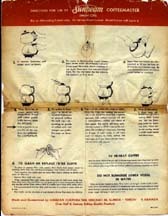 Until 2010, the thing used to be shot, kaput, a total loss (other than parts). However, as of July 20, 2010 the miracle of entrepreneur capitalism has provided you with a great ray of hope. All you have to do is go to the website of Dayseal.Com and order a new gasket. They cost about $30 plus shipping. The vendors will even help you get the old gasket off. This is a really great service, especially if you love the fantastic taste and automatic brewing associated with the C-30. We want to extend our very grateful appreciation to our reader Nancy who provided us with this information. Examine the filter in the same way -- if a cloth filter is present, make a note that you'll be spending a lot of time sewing those replacements. It's better to only buy the version with the metal filter. Over the course of the years, the design of the C30A changed incrementally (in some, the filter screws on and off). I only have one manual for one particular variant. The basic principles of the C30 reamained constant through the years, so the manual can still be helpful. 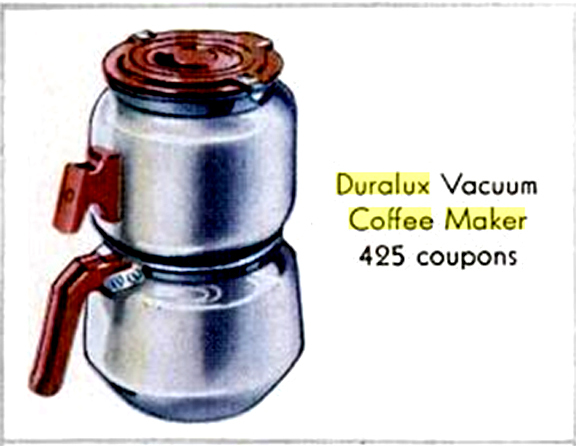 This is a vacuum coffee maker from the 1950s. Surprisingly, not much has changed from the 1920s other than the complications necessary to make the thing fully automatic. 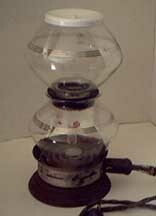 Of the vacuum systems, the ones from the 1920s make the best coffee --- if you keep a close eye on it and have ground your coffee specifically for a vacuum maker. At 1000 Watts, this thing uses a whole lot of electricty --- no Conservation was envisioned by the Westinghouse corporation. 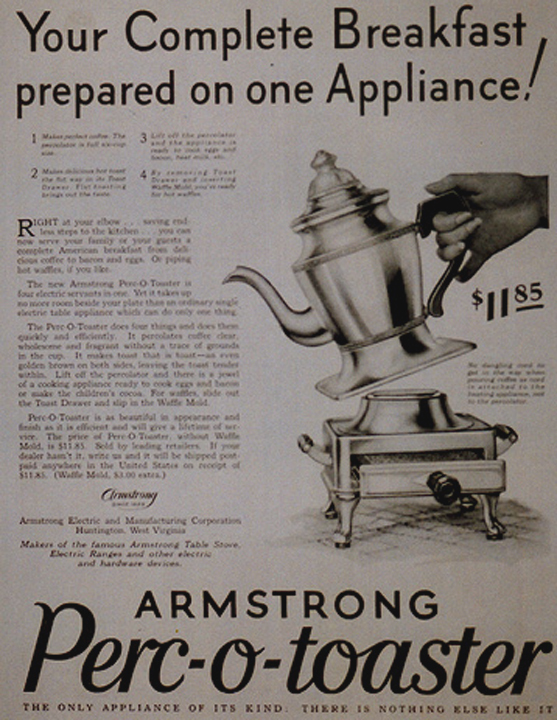 Their appliances from the 1950s are NOTORIOUSLY inefficient. 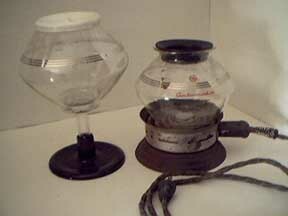 I found this little vacuum rig in New Market -- it has no maker's information than ABCO Metal Products. It certainly has a nice style! Here are three lovely Vesuvio style Espresso makers (6, 4, and 2 cup models). 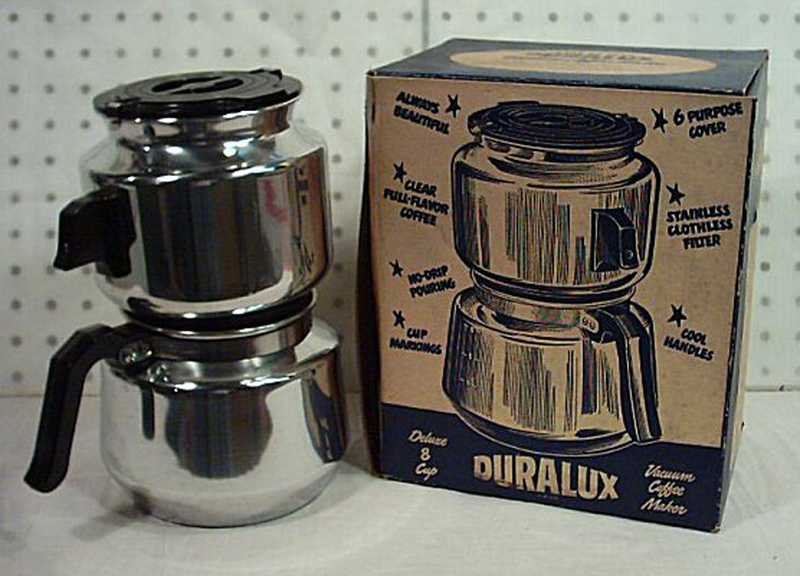 These things are widely available and can approximate a good cup of Espresso --- provided that you watch it very carefully, use distilled water and have very finely ground coffe. Tap water is death to these things because the minerals in it greally clog up the pressure valve. These things have to be kept scrupulously clean! These are the stovetop equivalent of the yuppie machines available at Williams-Sonoma. On the left is a milk-frother. 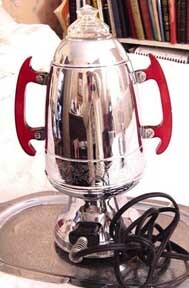 It is simply a base unit from a Vesuvio-type machine with an attachment to allow steam to be directed into a container full of milk. 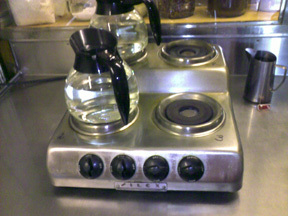 The device on the Right contains a "charge" of coffee" It is placed directly on the burner and heated until; steam, rises in the cylinder. 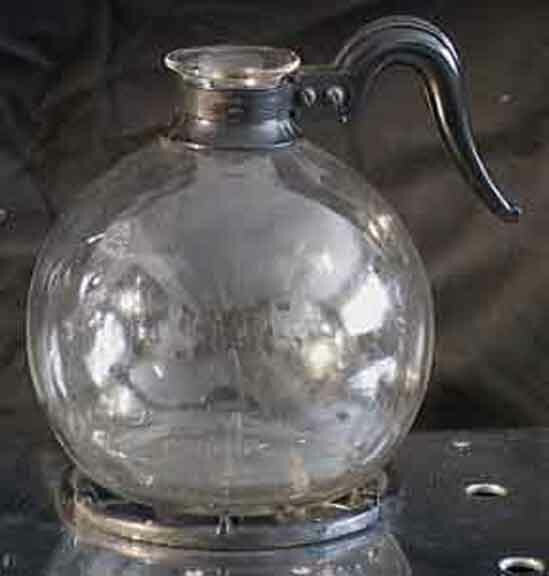 The black valve is turned to direct steam into the charge and the recovered liquid is held in a small server. BUT -- the steam pressure is not sufficient to extract all the oils that are essential to True Espresso. 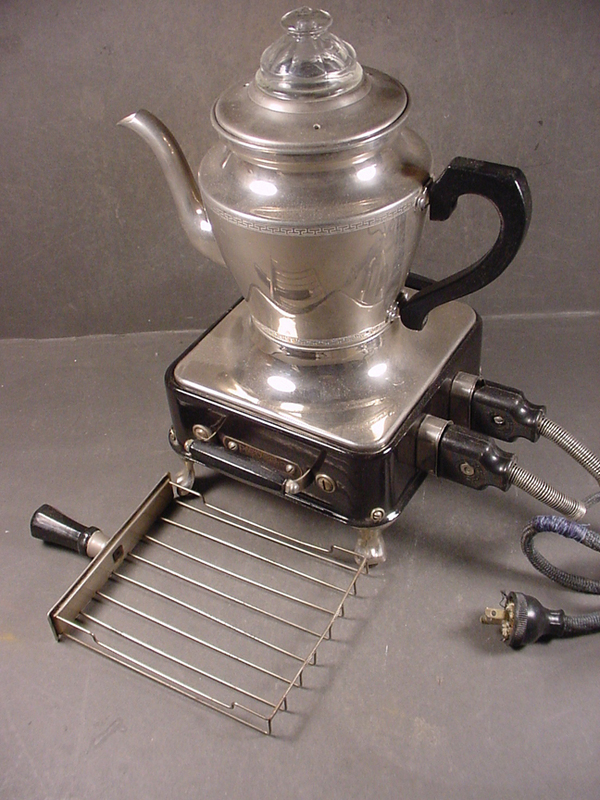 This is a very interesting "hybrid" appliance that was manufactured during the 1920s by the Armstrong Electric Company of Huntignton, West Virginia. The unusual design has the toast elements in a drawer with heating elements on the top and bottom so that no "turning" is necessary. (It makes one slice at a time.) 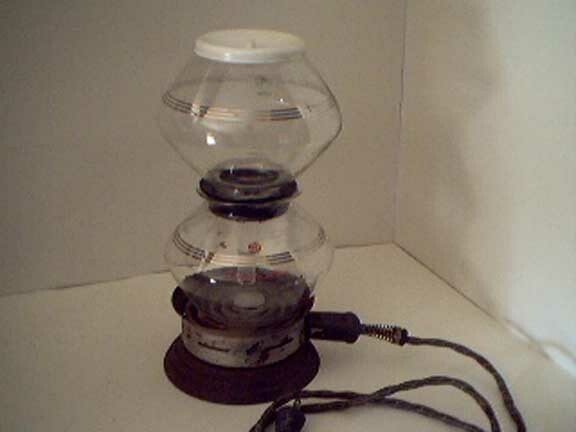 A separate mound-shaped compnent contains heating coils and fits within the bottom of the percolator. These items are quite rare. 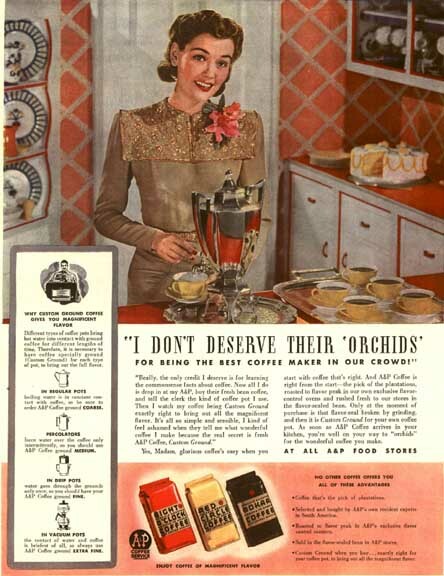 They were very well made but were rendered obsolete by newer, cheaper multi-slice toasters. Also, the percolator process does not make the best coffee. 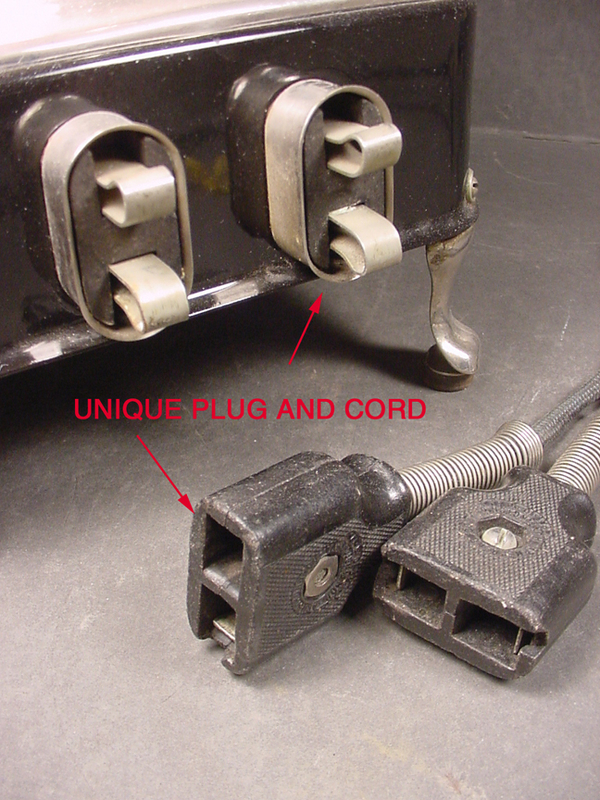 If you are contemplating buying one of these, you should be very careful to insist on seeing the original cord and plug -- this uses a noonstandard plug arrangement that cannot be duplicated with new or period cords. If you buy one, make sure that you get this! 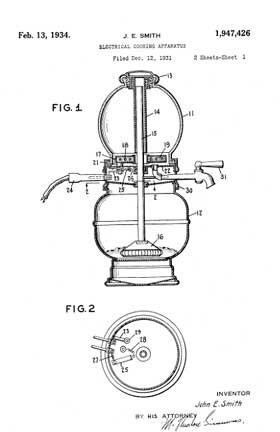 As percolators go, this is more-or-less the classic. 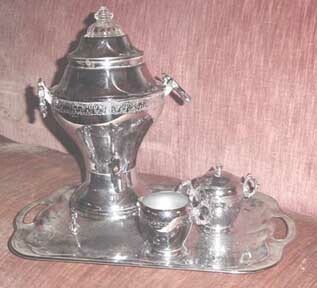 It is designed to look like a seventeenth century Georgian silver coffee server. It is made of stainless steel. One of the commercial advantages of the percolator system is that they could be camouflaged to look like elegant silver pieces. The brewer is also the server. All of the other systems impose very specific design requirements and are somewhat inconvenient in that they have to be dis-assembled prior to serving. 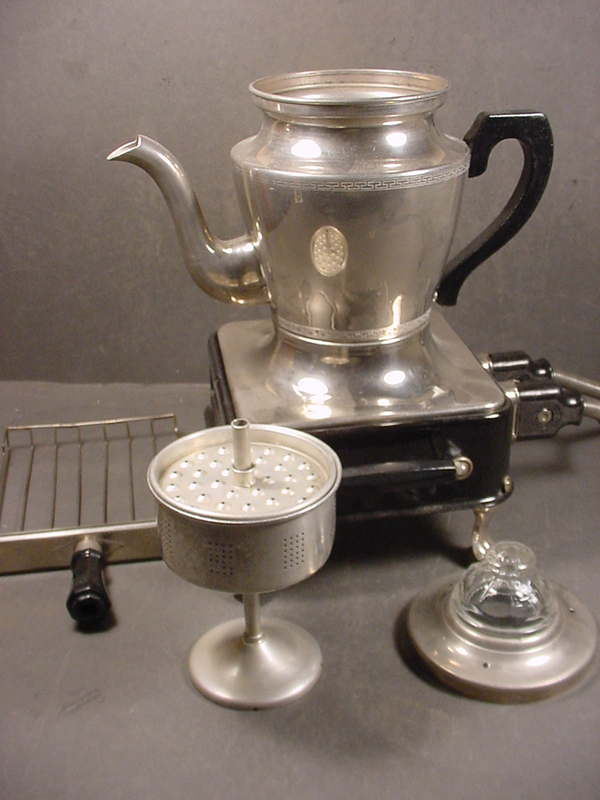 The percolator is "all in one piece" and enjoyed considerable popularity due to this simplicity. The key, is be patient, be gentle and try to use this pot at least twice!!! There is a learning curve! Fill pot with pure filtered water for best taste! 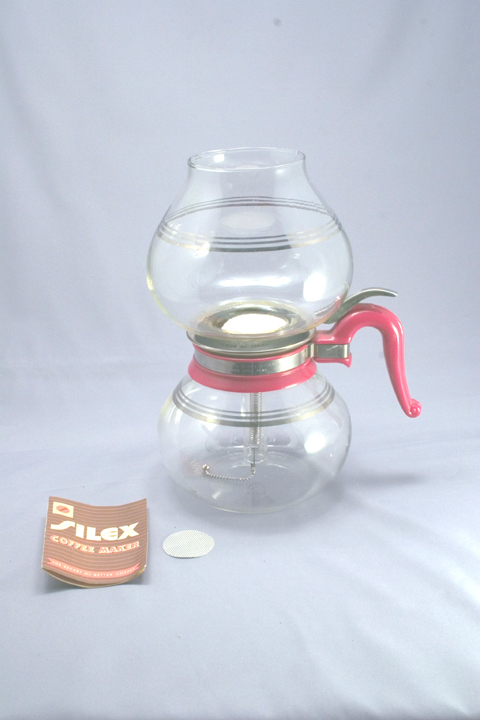 - The Pyrex FLAMEWARE brand percolator has beverage cup markings for measuring. 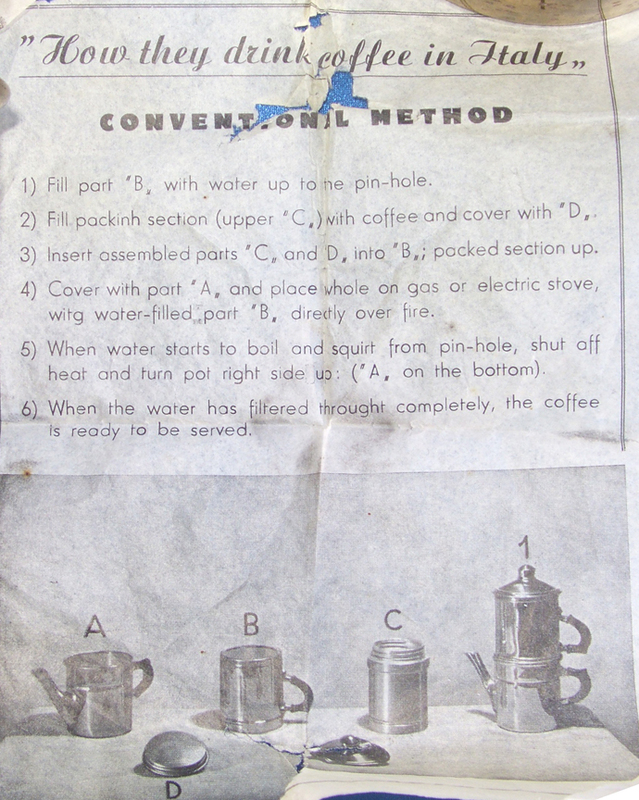 Put water into the percolator bowl below the "9"on side of pot. (Note: 9 Pyrex cup is about 8 measured cups of liquid about 5 oz. per cup, so do not overfill! 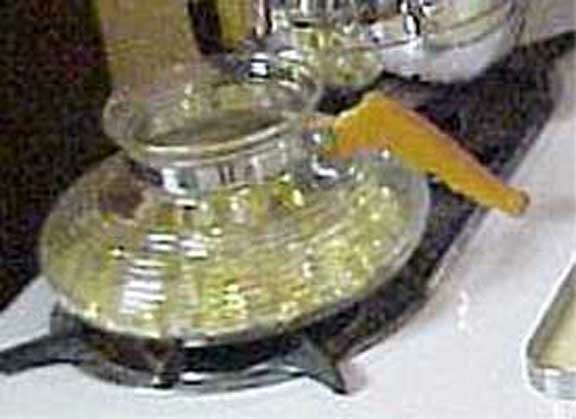 Gently place the "basket with attached metal bottom" onto the glass insert already in the pot. Place metal cover on top of basket and snap gently into place. 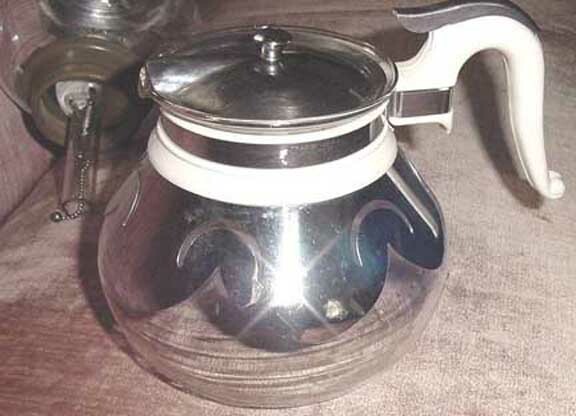 - Place the glass pot cover on the pot, noting the ridges on the pot only fit on in one way, and gently turn lid to lock into place. 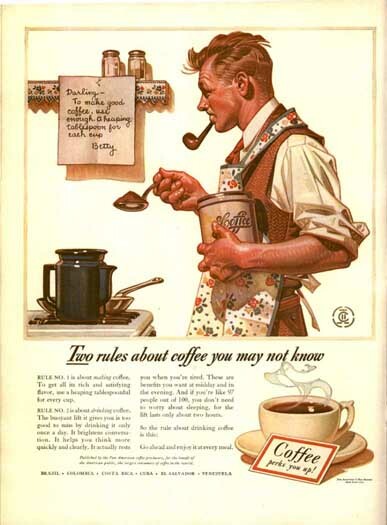 Making a full pot of coffee is preferred, but do not make less than 3/4 capacity of the coffeemaker. IMPORTANT! If you try to remove the insert while coffee is hot, you will burn your fingers. (I bet this is where most people drop and break the inserts! So if you feel you must remove the insert to pour, be very careful! you might try a silicone glove. If mineral deposits collect on flameware, boil a solution of 1 part vinegar and 3 parts water for about 20 minutes, in the pot; or use the newer product CLR, available at Wal-Mart. For discoloration from coffee or other cleaning problems, use non-abrasive cleansers such as baking soda, Bon Ami, Zud, with plastic or nylon pads such as Dobie. Do not use metal or abrasive pads! If Coffee grounds do get in the coffee don't panic! I use a coffee press when this occurs. After the coffee is brewed I pour it into the coffee press to strain out the grounds if that occurred. Or you can pour it through a strainer into a cup or bowl, with a paper towel, a piece of cheesecloth, or a coffee filter inside the strainer! You might ask yourself WHY go to all this trouble for a cup of JAVA? The answer is that this is most likely the most delicious cup of coffee you will ever taste! So remember to be gentle, and enjoy your coffee! 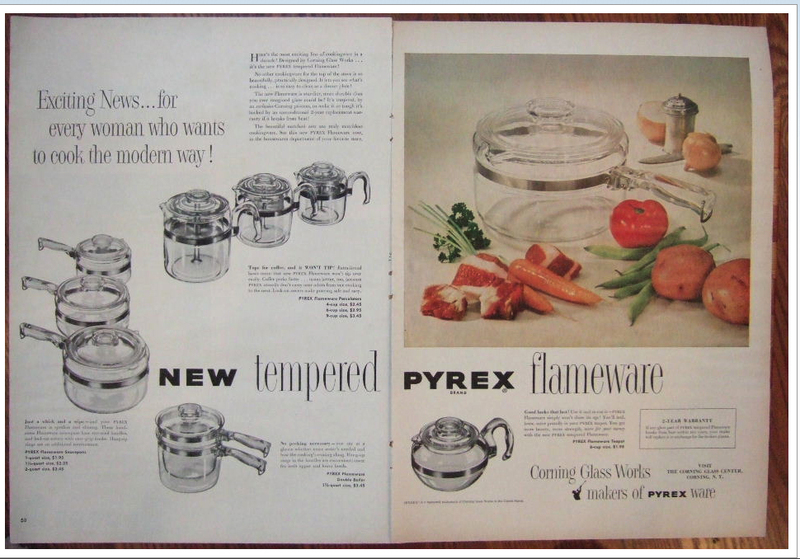 Our thanks to Candy -- here is an ad for the Pyrex Percolator that shows some of the various sizes available. 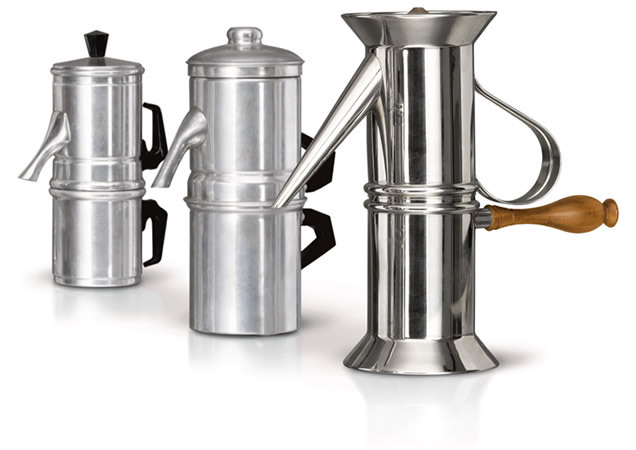 You can still buy these percolators. 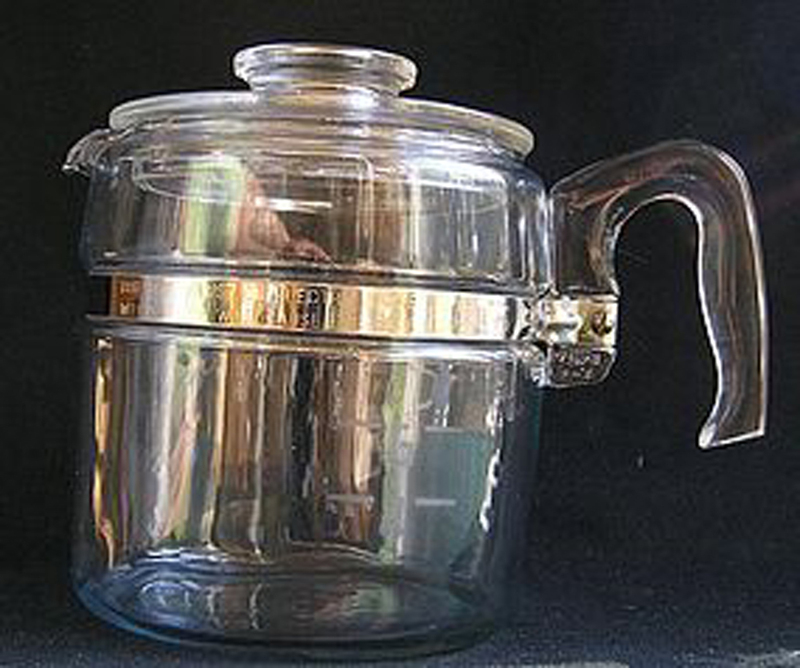 Here is the bottom half of a Farberware Vacuum Coffee Robot, this time disguised as Dutch colonial silverware. I do not own the top half. 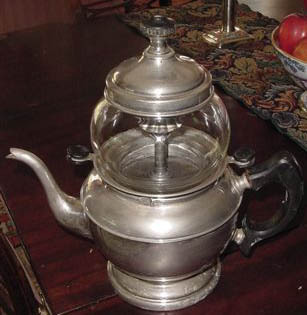 When I got this, someone had stuck a percolator basket in it. They were probably fed up withthe difficulty of using the vacuum system and tried to do something else with it. I only have the bottom...sigh.. 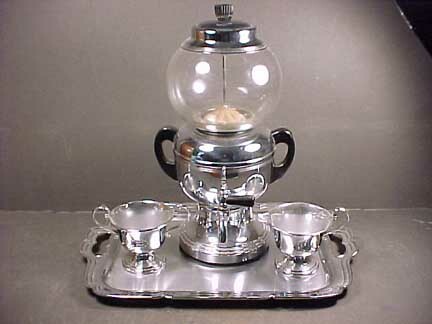 Here is a very lovely Farber Coffee Robot Model 511 with an accompanying Tray, Sugar and Creamer. The exterior was designed by Simon Farber of Brooklyn, New York. However, he relied heavily on both Ms. Pierce and John E. Smith (of Belleville, Illinois) for the "automatic" shut-off feature. 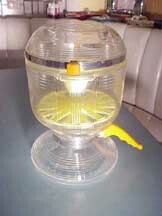 We are indebted to "Acme Ron" for sending us this wonderful photo of a brand new "never-been-used" Farber Coffee Robot. Here is the original shipping tag! 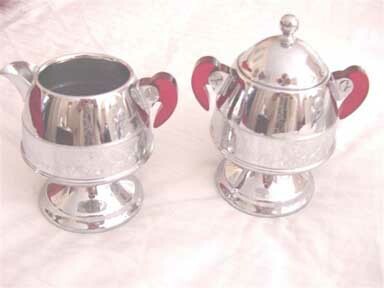 This is a very lovely "LaBelle" coffee service. The photos were sent by our reader "Pru." This would have been a wedding or anniversary present. 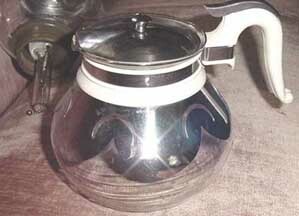 Unfortunately, it is a percolator and it does not make very good coffee. I don't know anything about this mark other than the fact that it was made in Brooklyn. 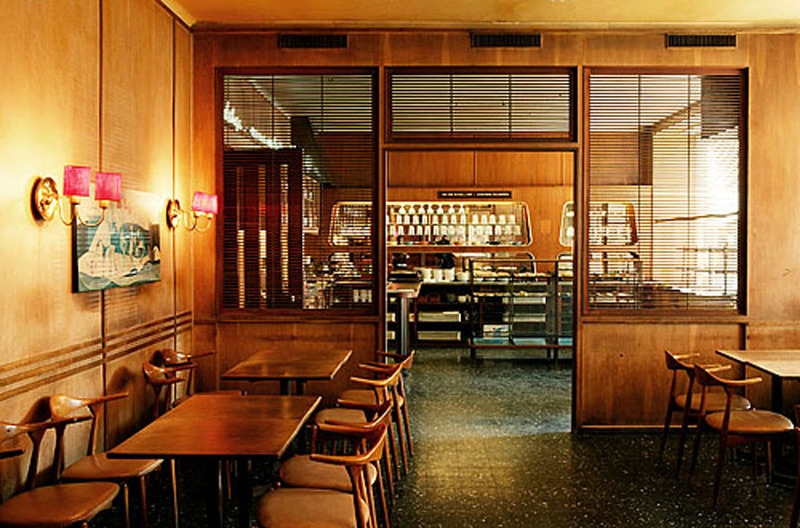 Click here to look at another type of collectible, or keep on scrolling for more Coffee stuff. 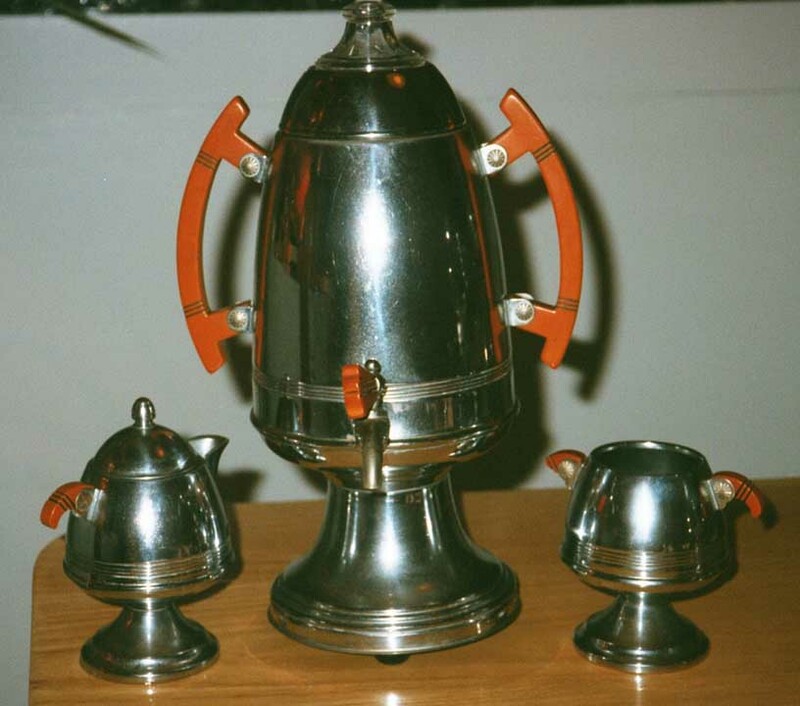 This is a WONDERFUL Art Deco shape -- the beehive urn with Catalin Bakelite handles, plus the lovely cream and sugar set. 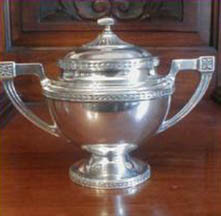 This was the quintessential middle class wedding present of the 30s and 40s, so there are a whole lot of them around. 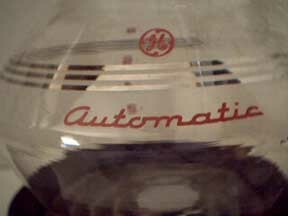 This is not automatic --- you have to watch the color of the coffee in the little glass dome to decide when it is done. It makes LOUSY coffee. Here are some photos of another United Coffee Set, this time with plexiglass handles. These were sent in by "Pru", one of our readers. 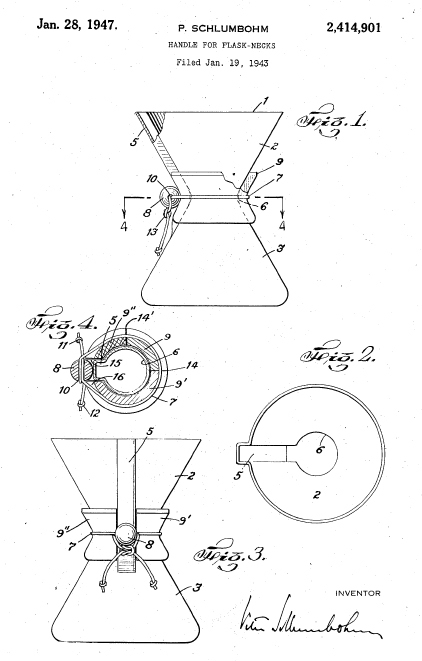 We are indebted to our reader David from the History department at Wooster College for theis analysis of the Duralux Coffee Maker. 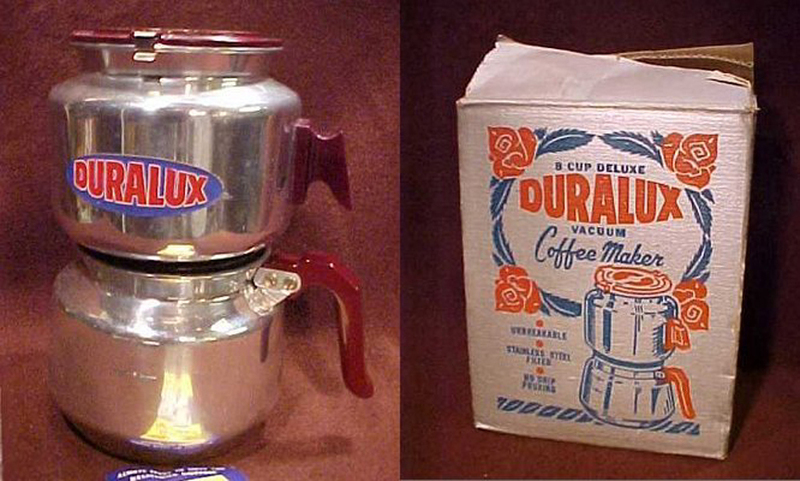 "... here is a coffeemaker from the early 1950s called Duralux, made in Wooster, Ohio by the Buckeye Aluminum Company. 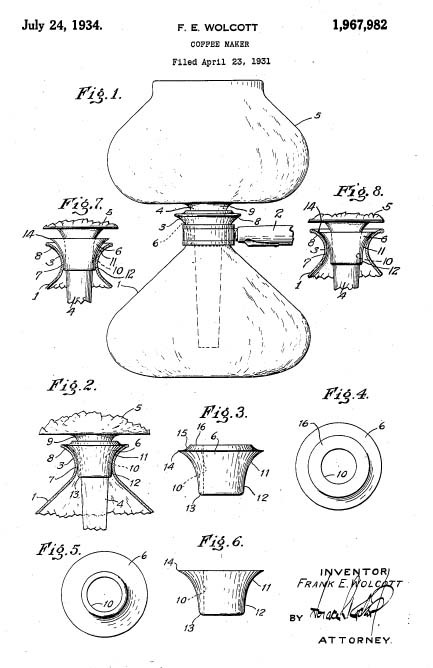 It incorporated a unique filter), and it was patented by a local inventor and businessman who worked for the company, Mr. Joseph E. Fishelson, who later was president of Akron Brass and Red Head Brass. 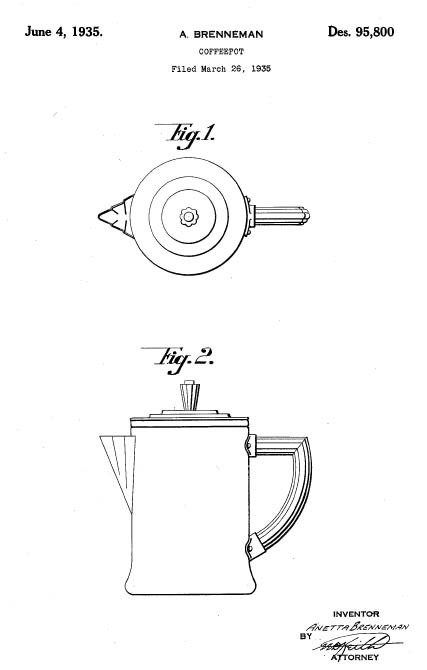 Attached is the patent and a photo of the coffeemaker. 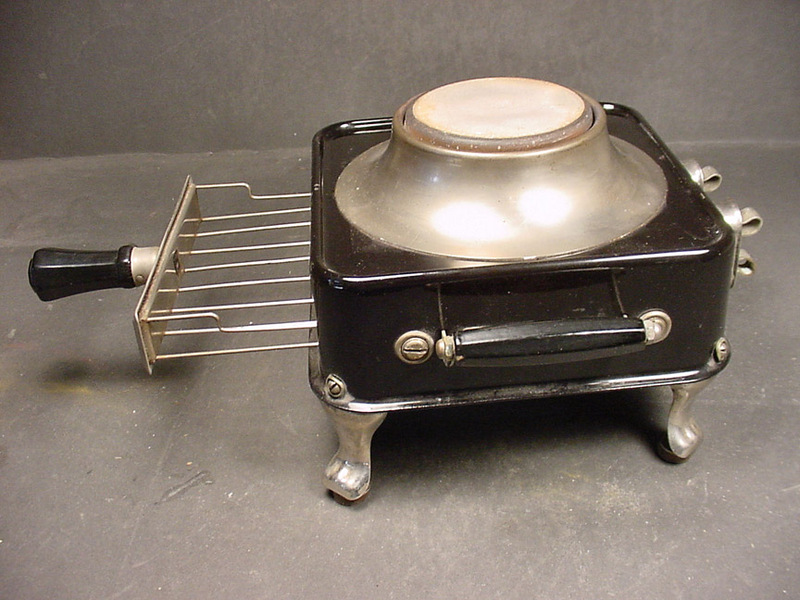 It had a nice design and was basically a stove-top model, though it could be matched with a hot plate/burner (like a Cory or a Silex burner), since it was aluminum. ..."